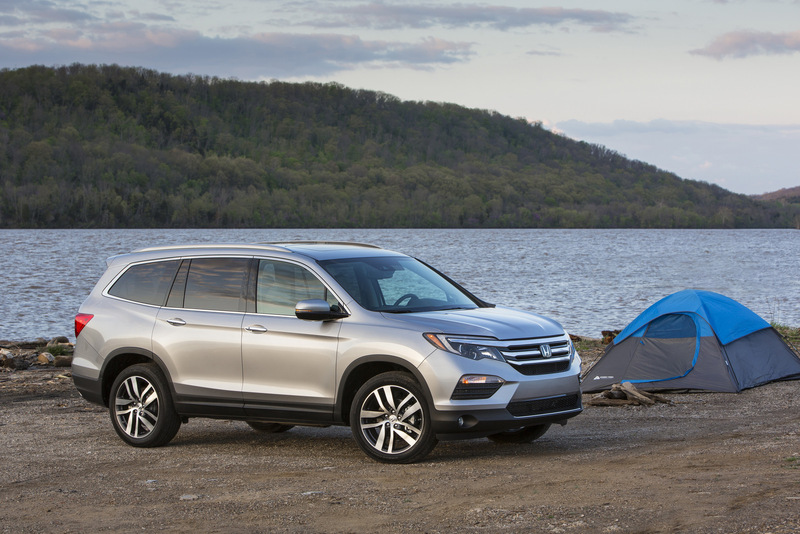 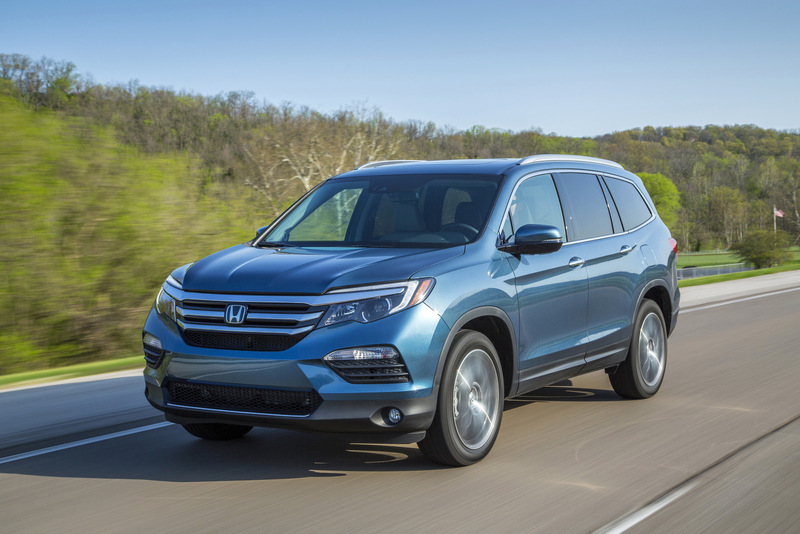 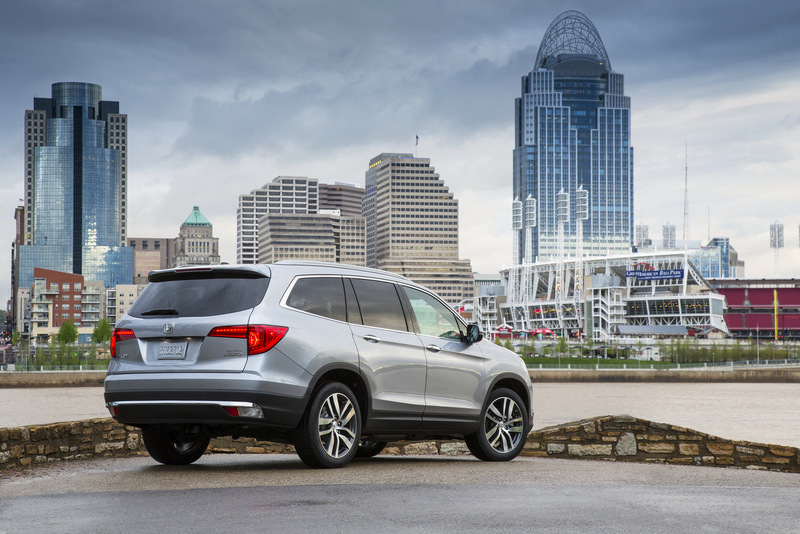 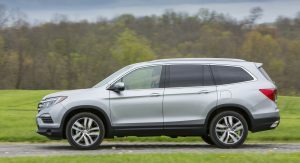 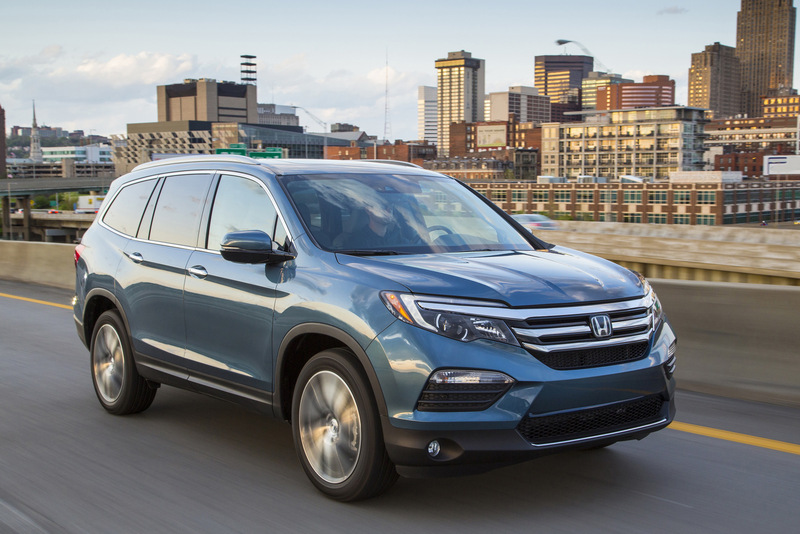 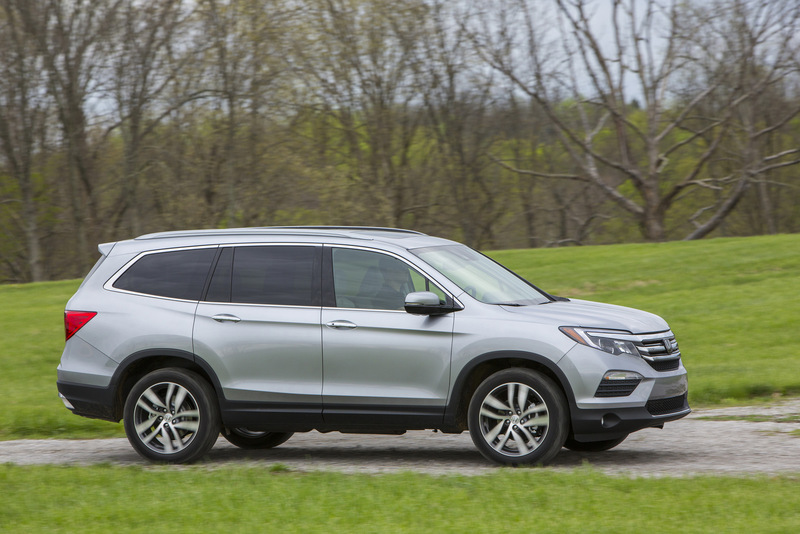 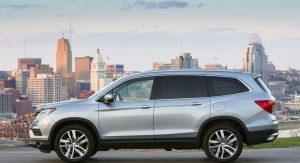 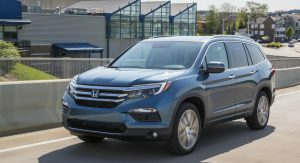 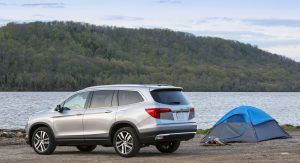 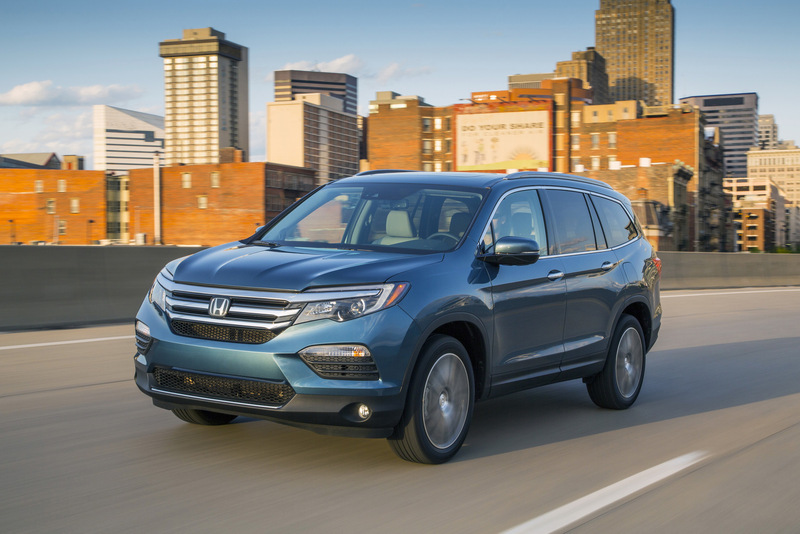 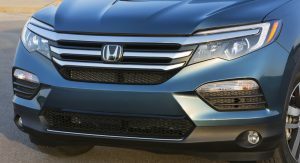 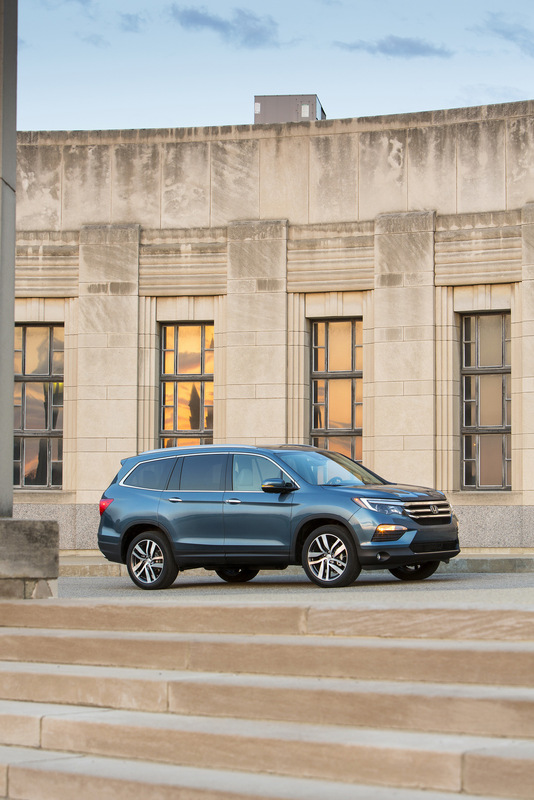 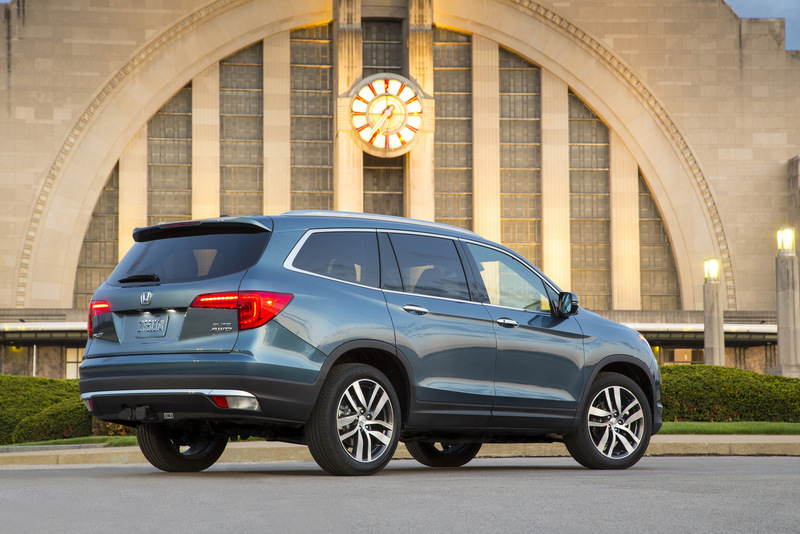 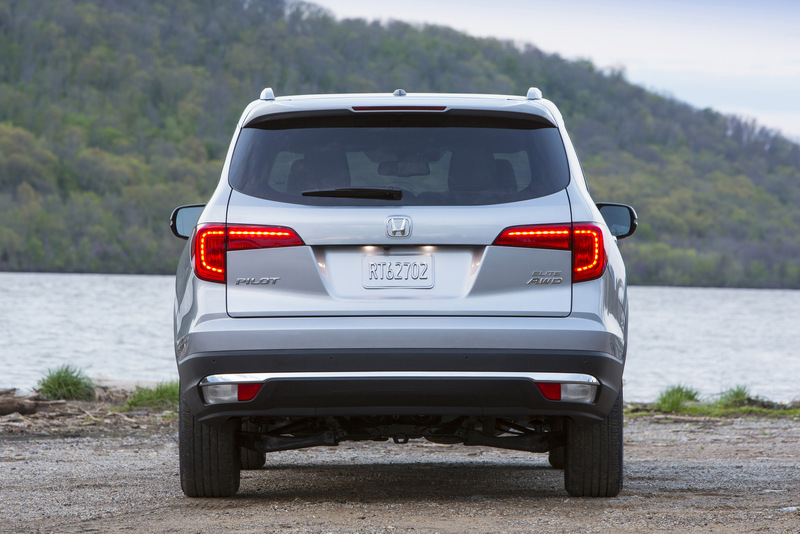 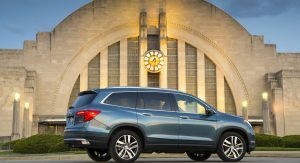 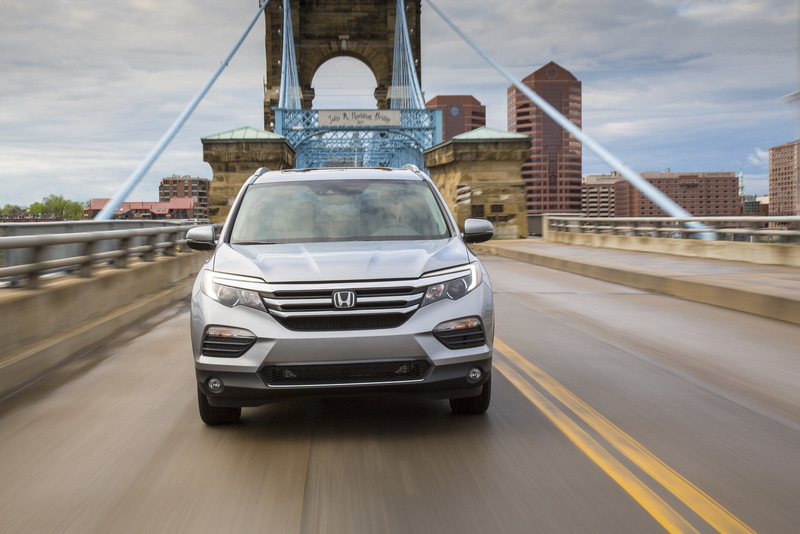 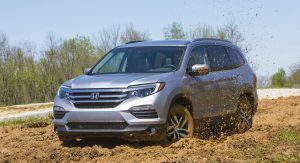 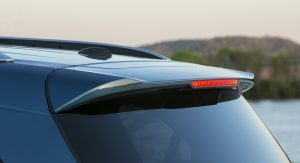 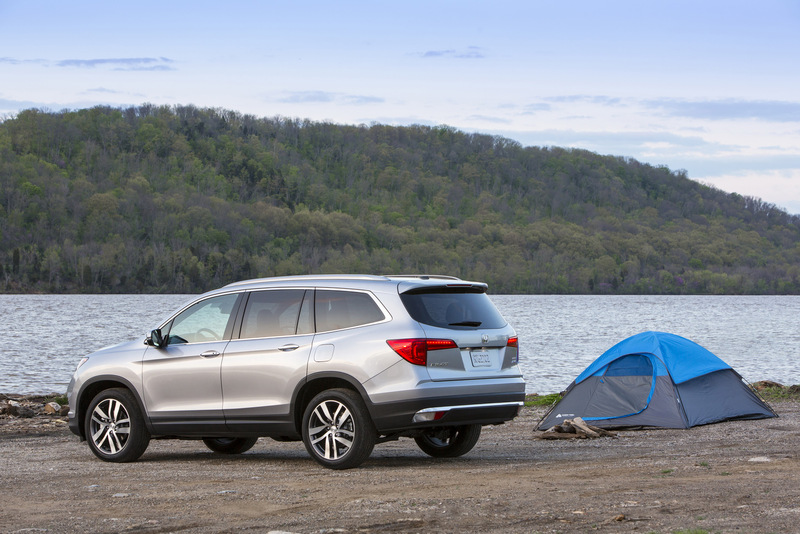 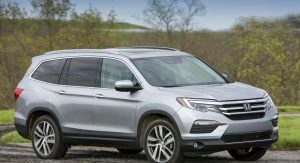 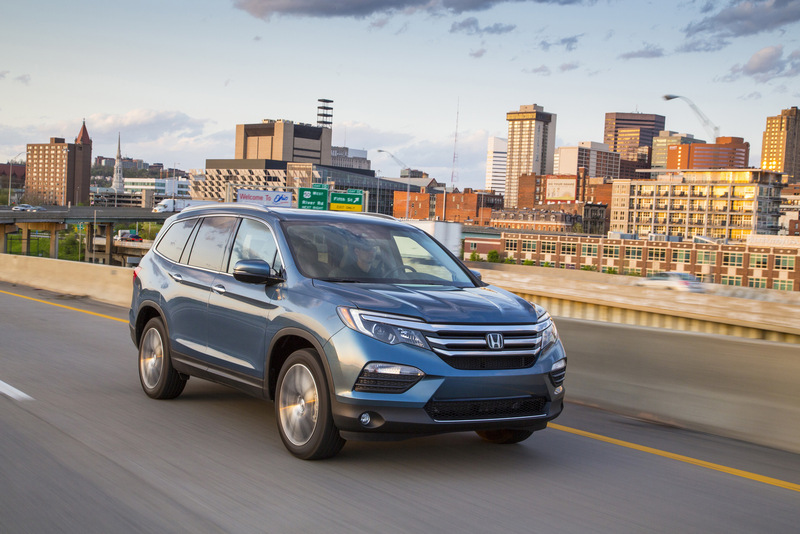 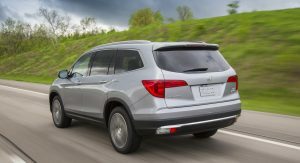 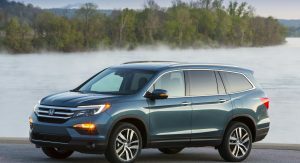 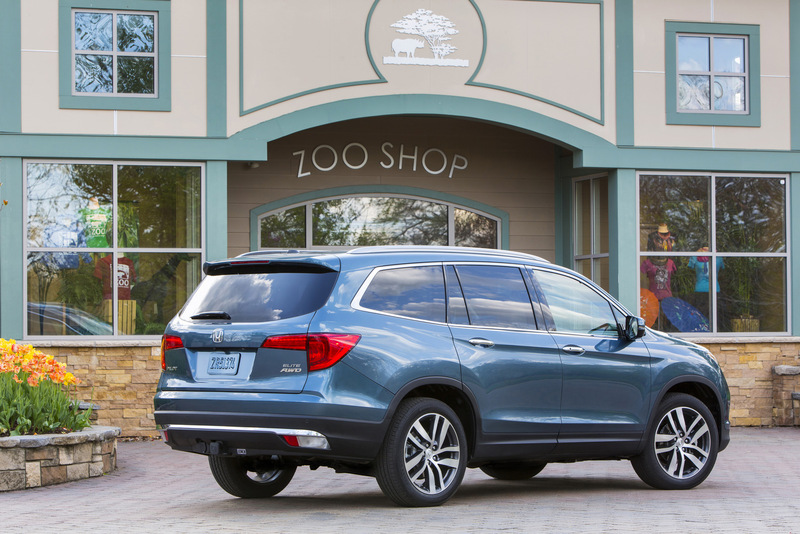 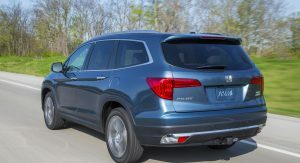 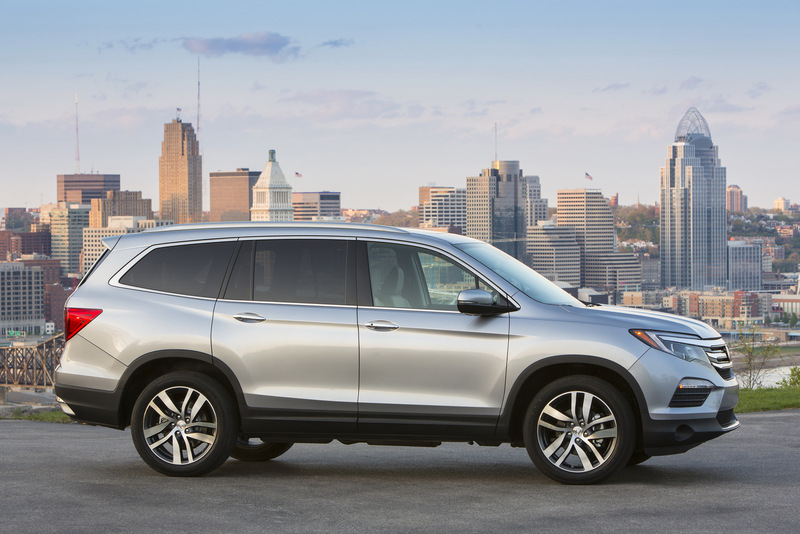 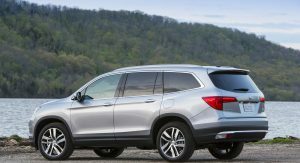 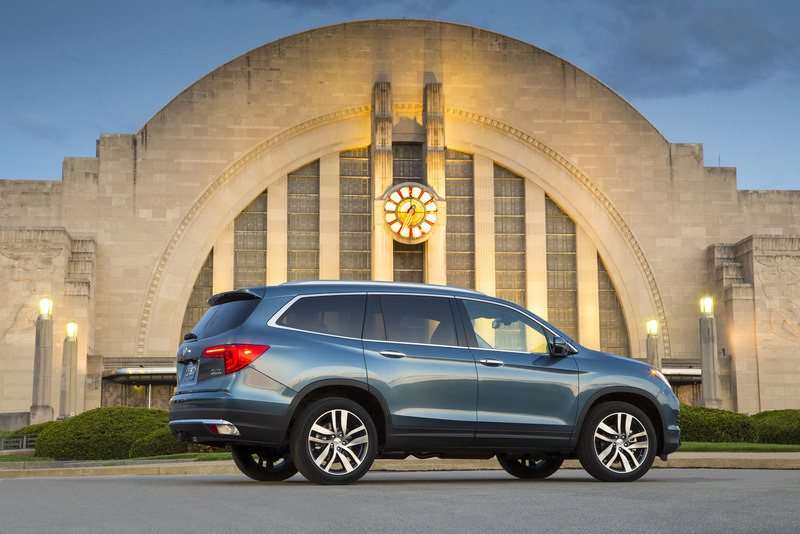 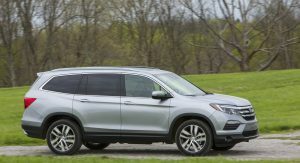 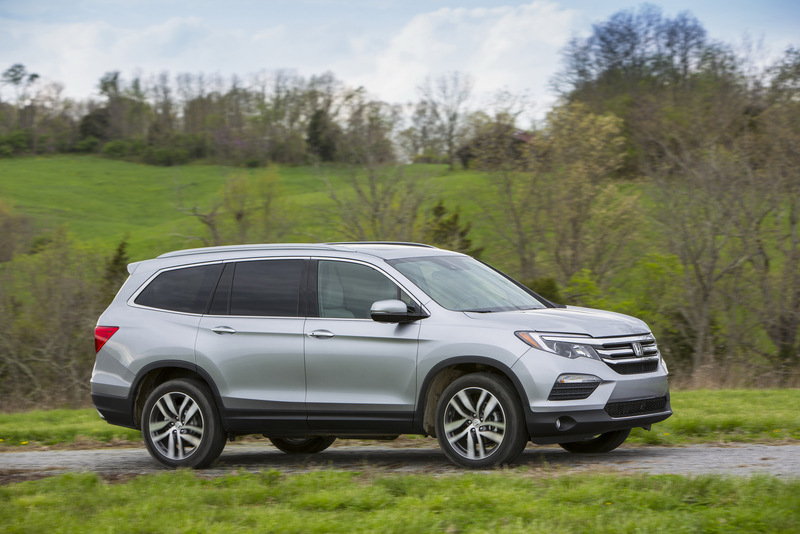 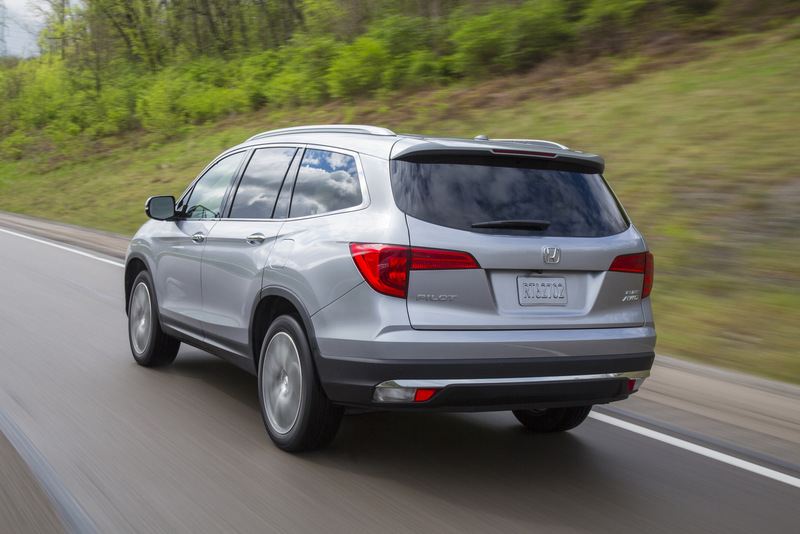 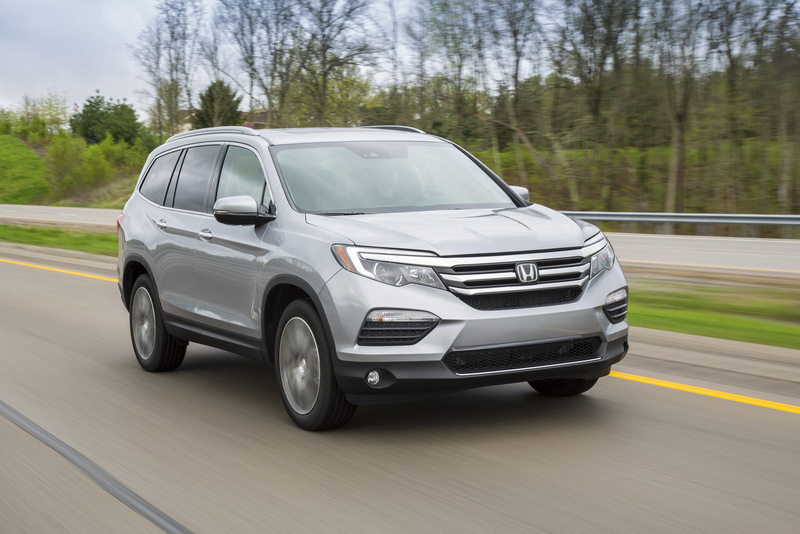 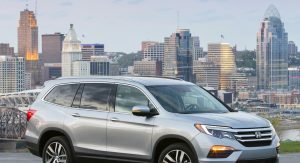 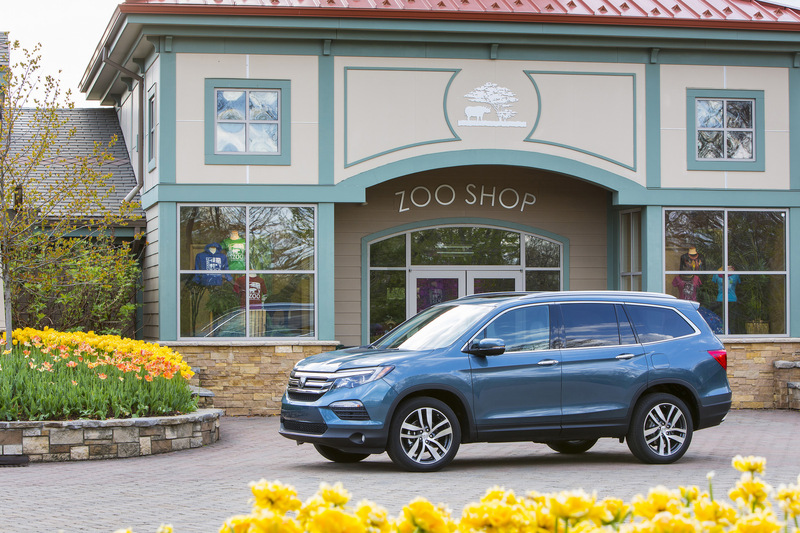 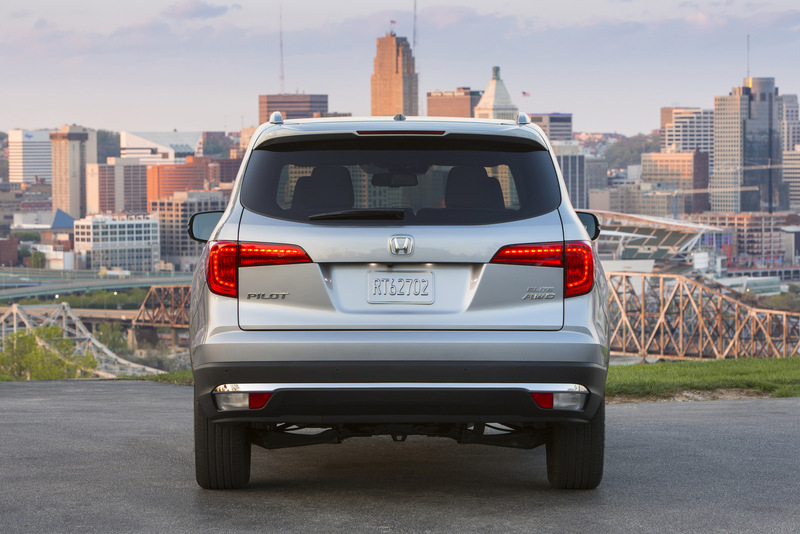 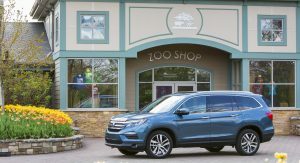 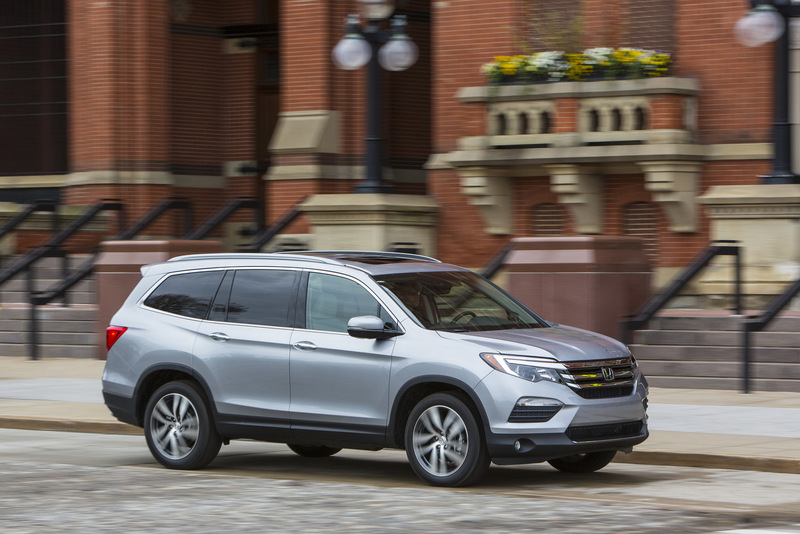 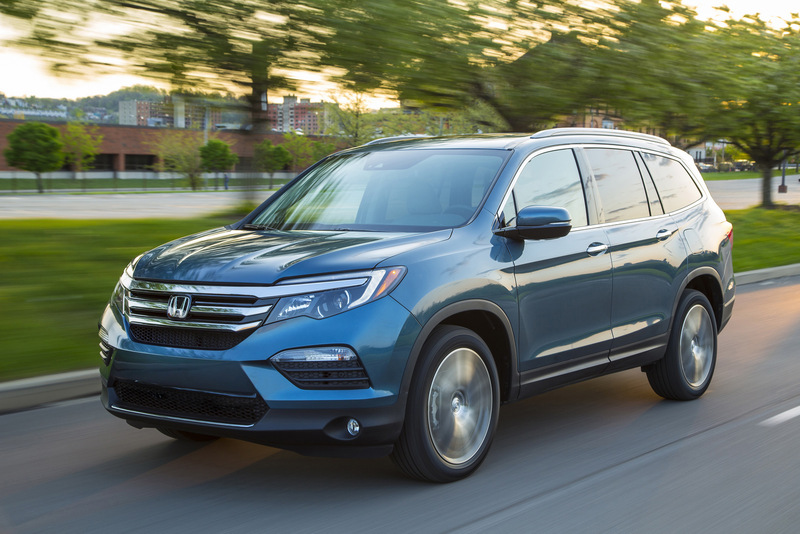 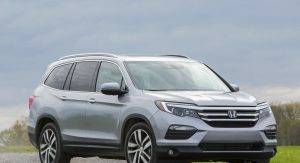 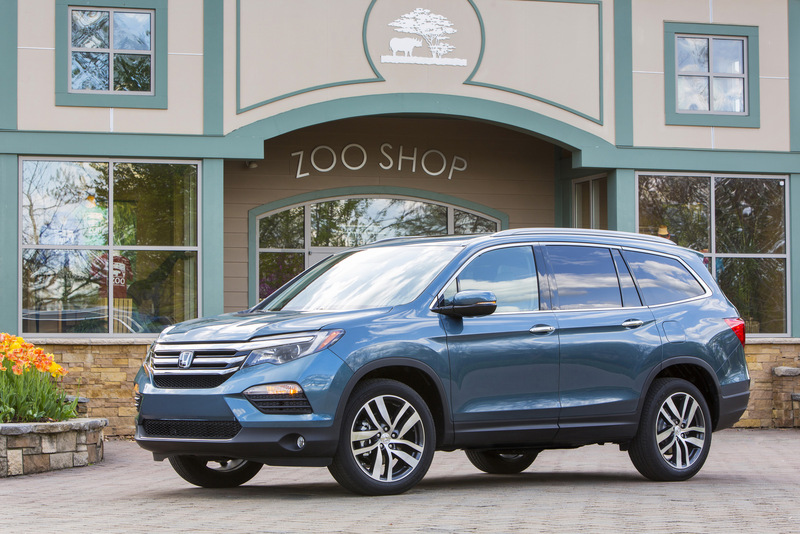 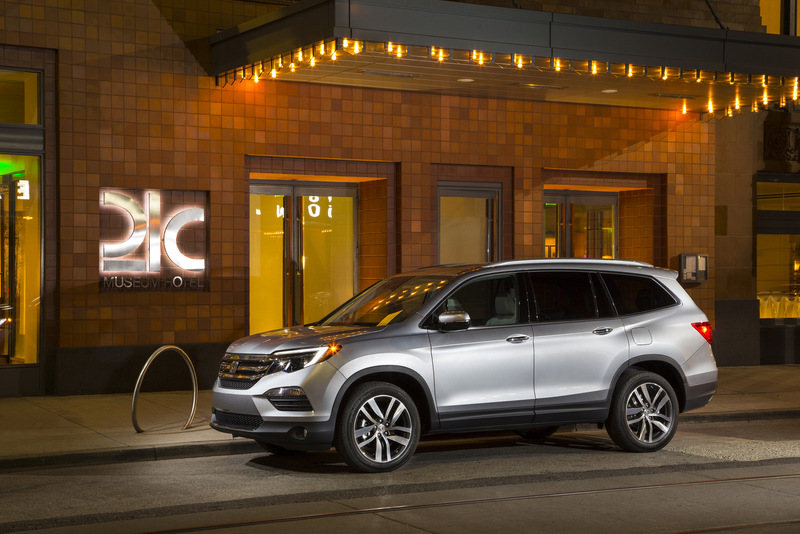 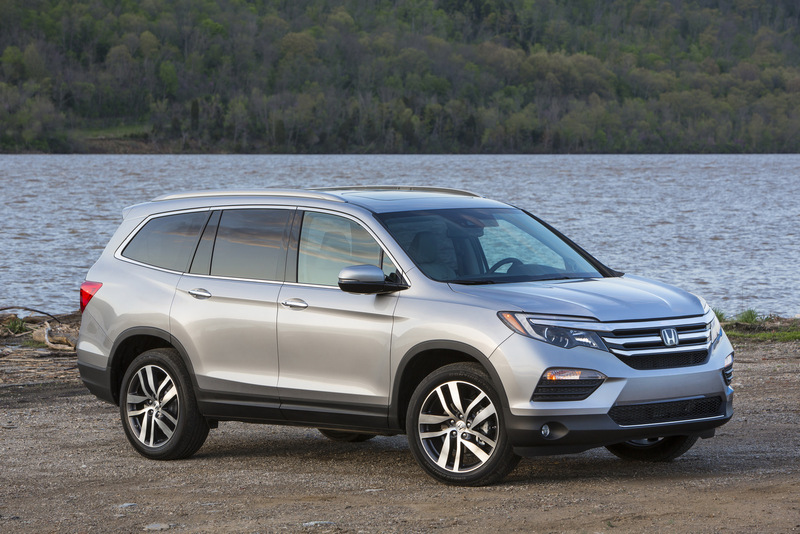 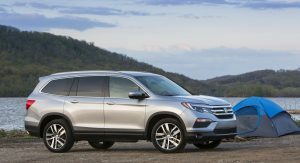 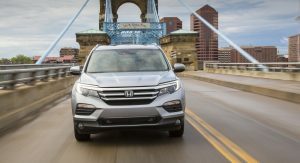 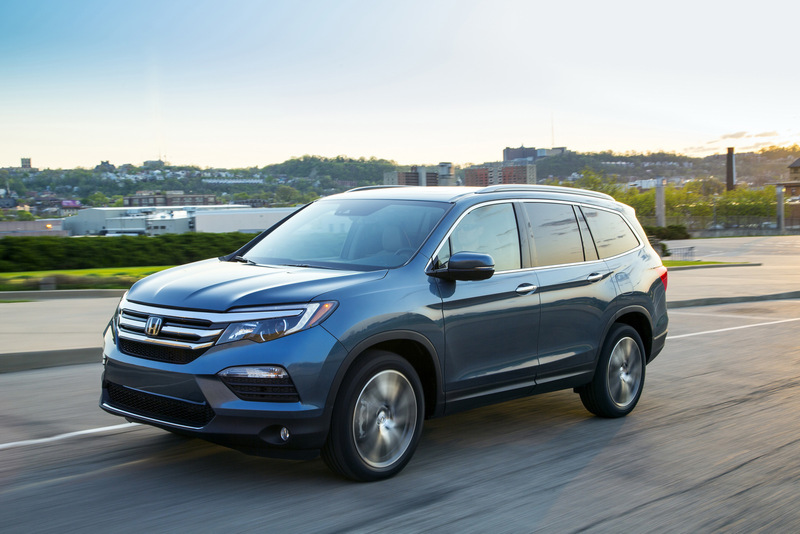 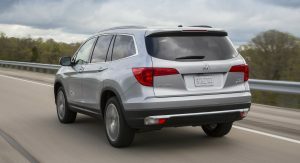 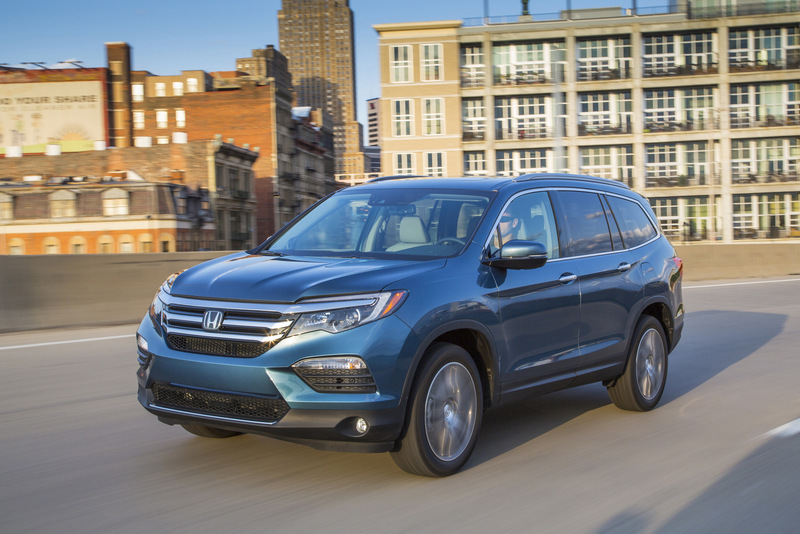 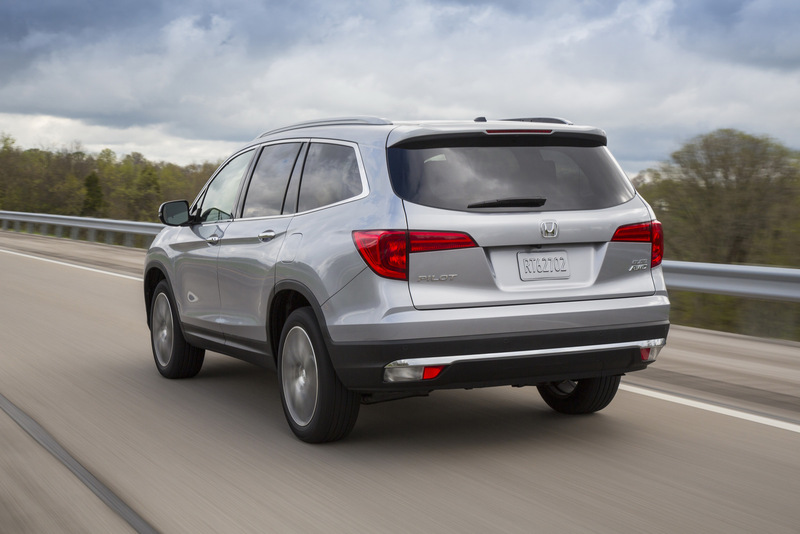 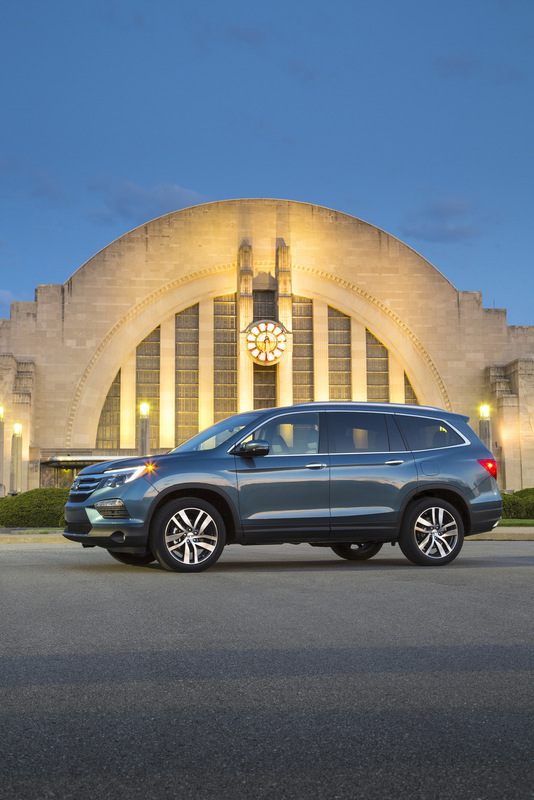 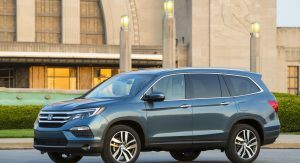 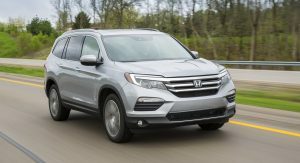 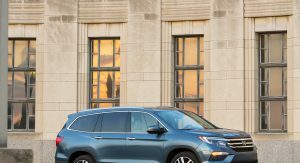 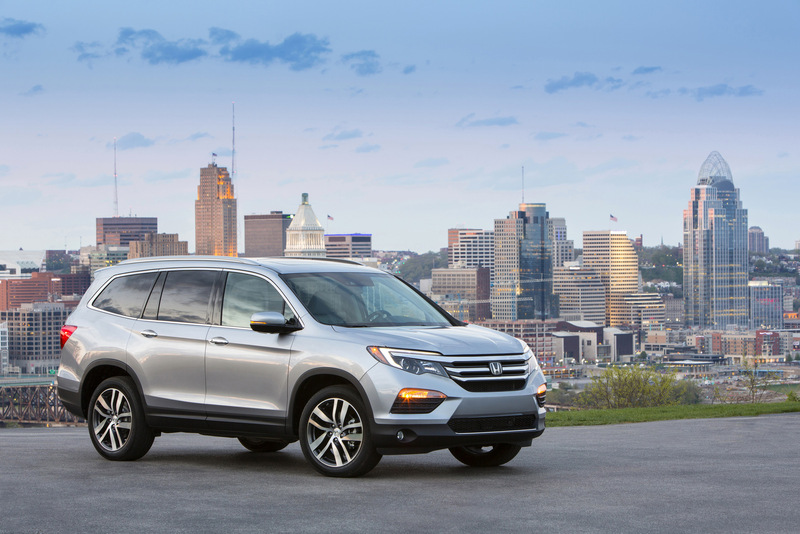 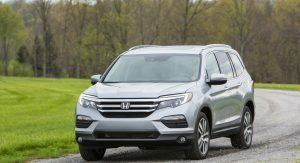 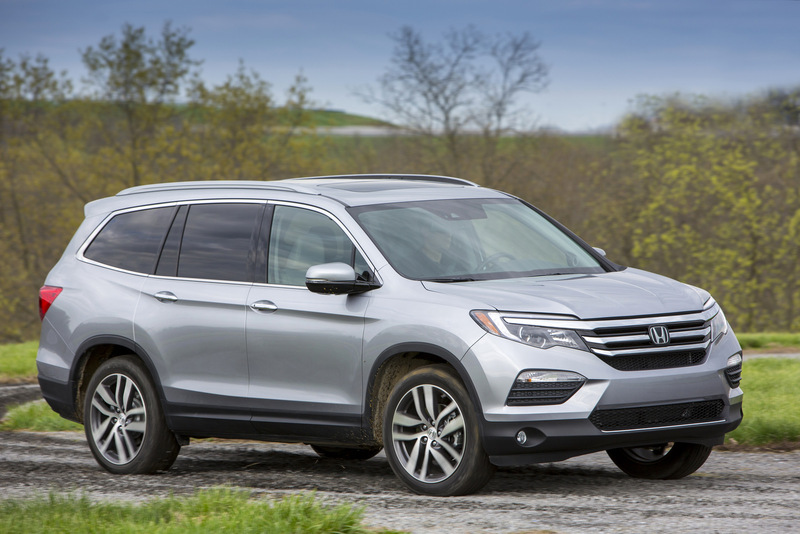 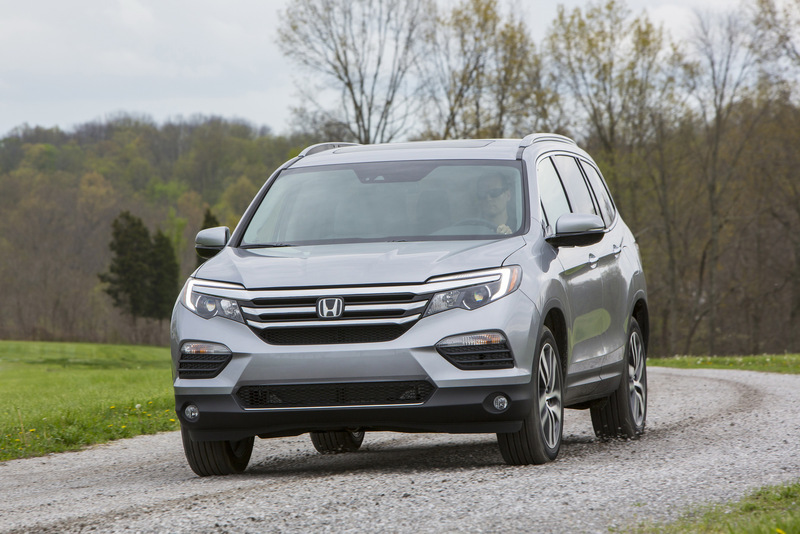 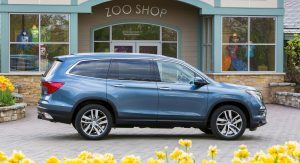 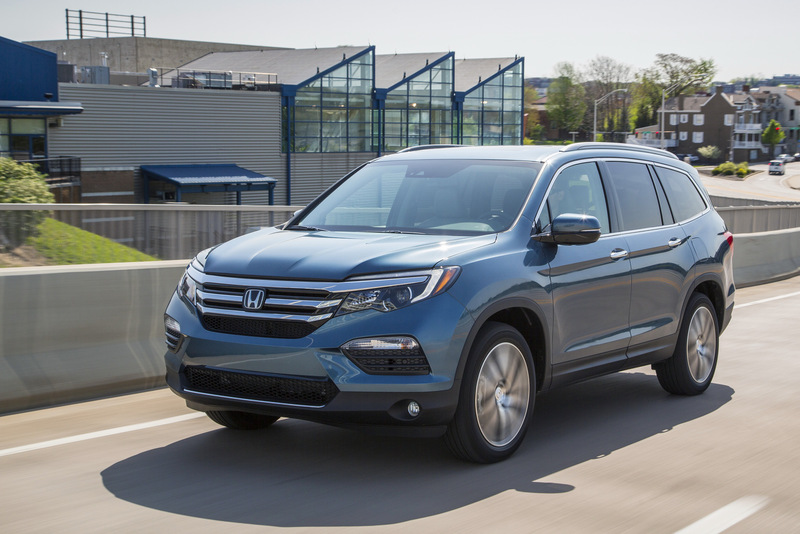 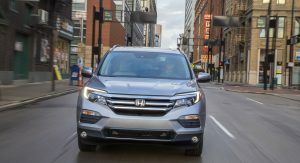 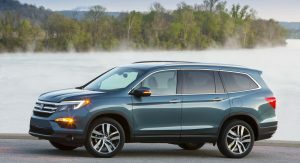 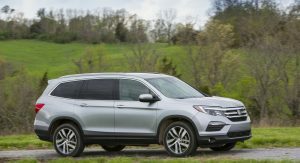 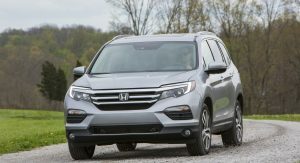 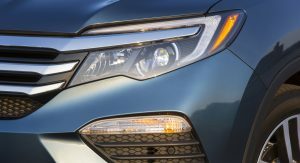 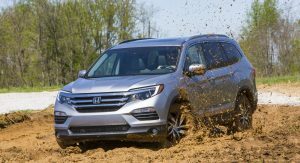 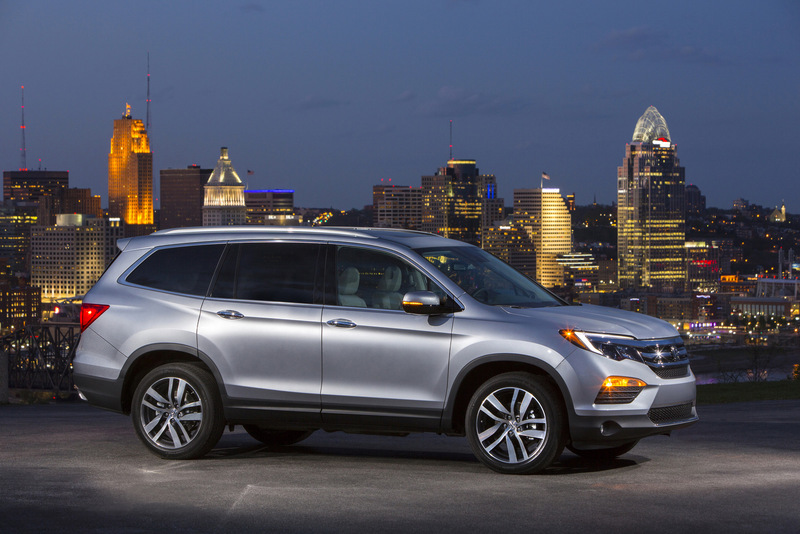 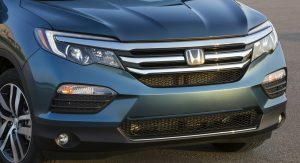 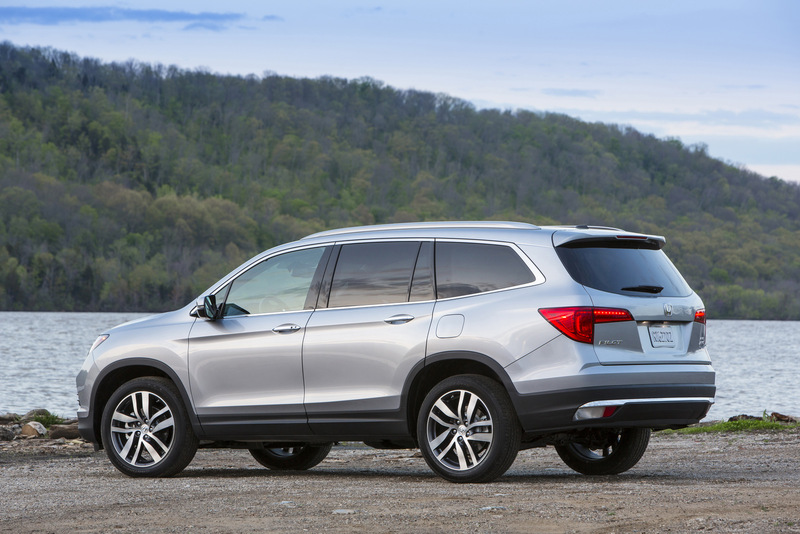 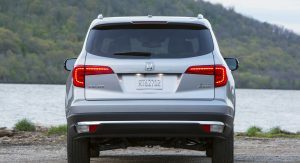 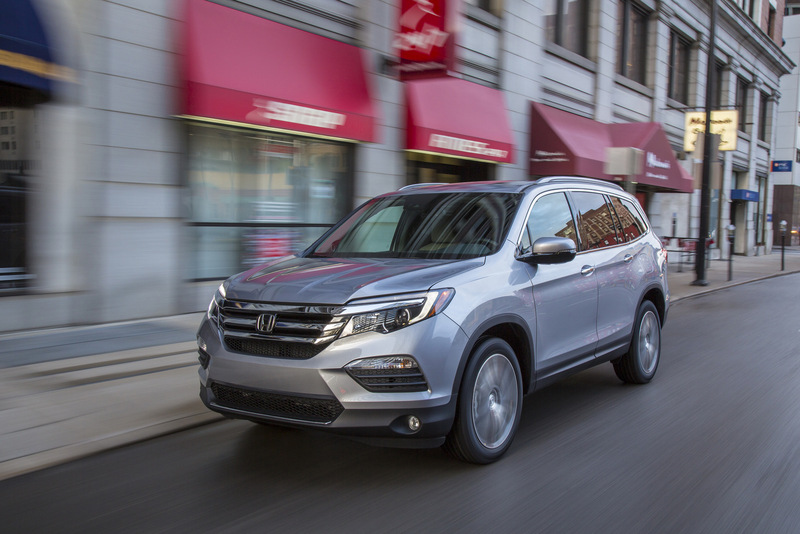 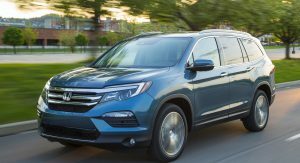 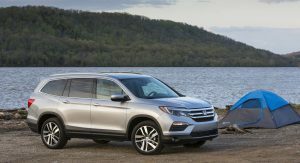 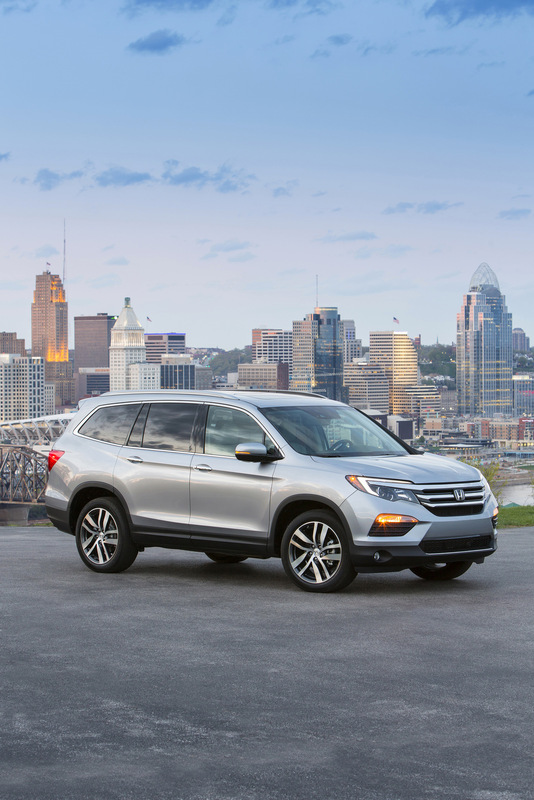 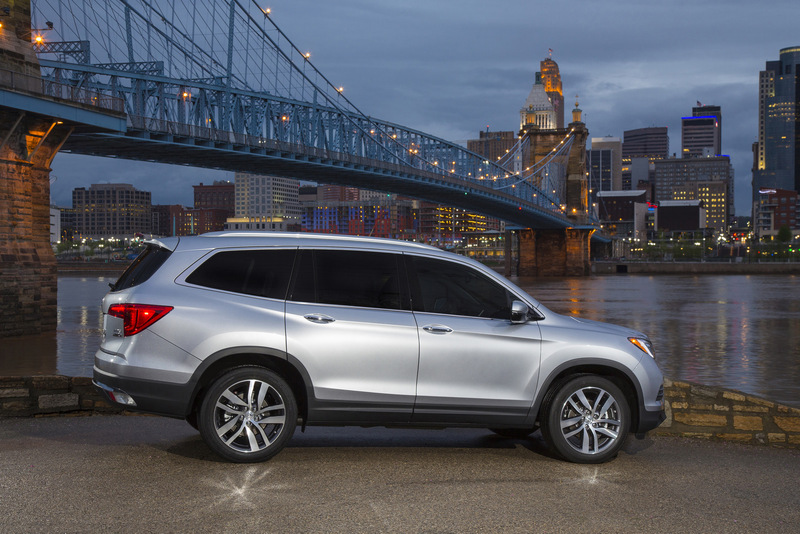 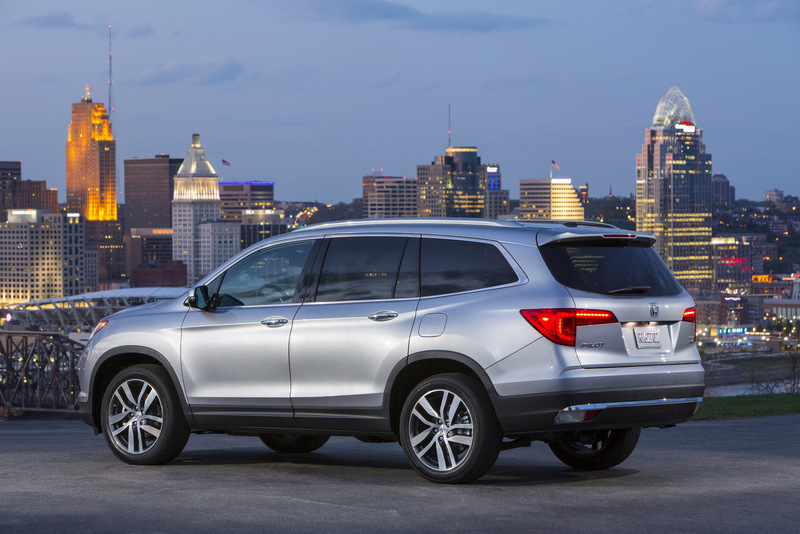 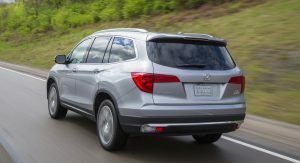 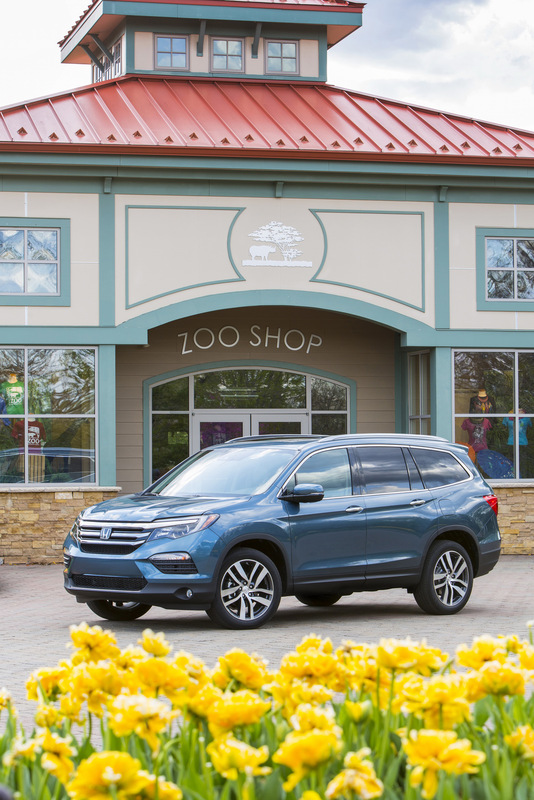 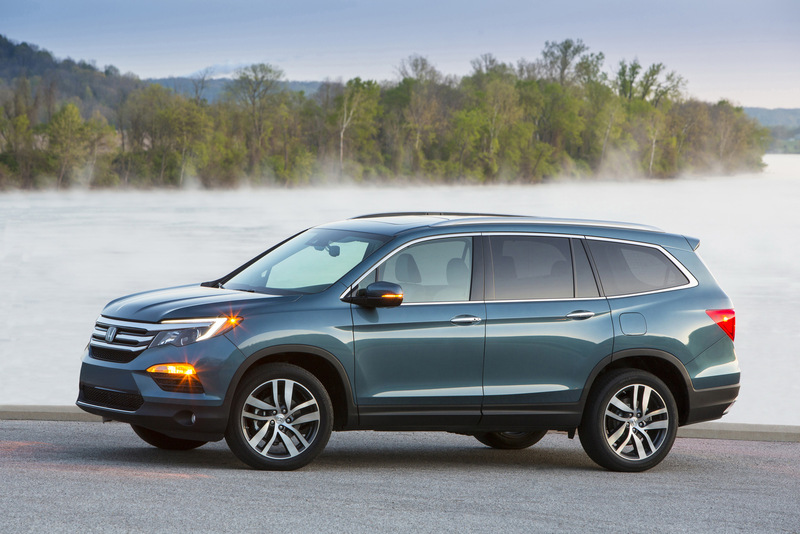 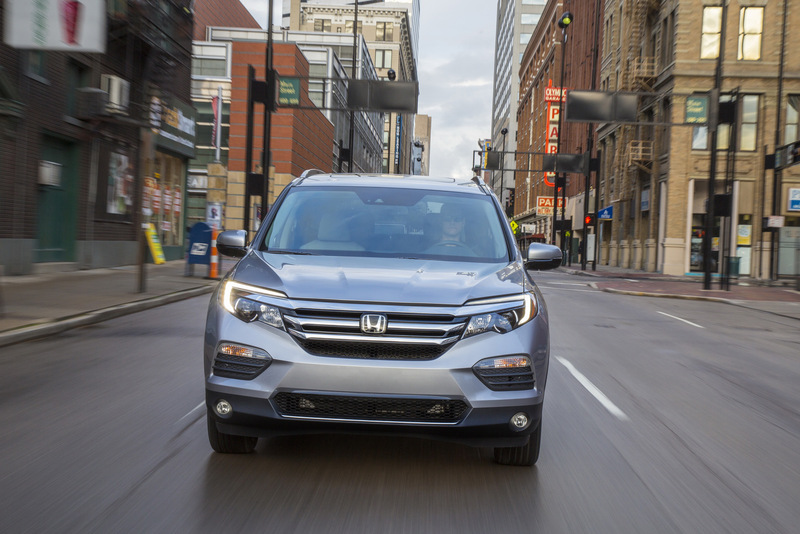 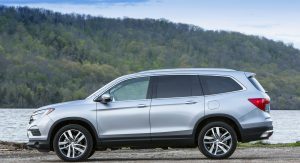 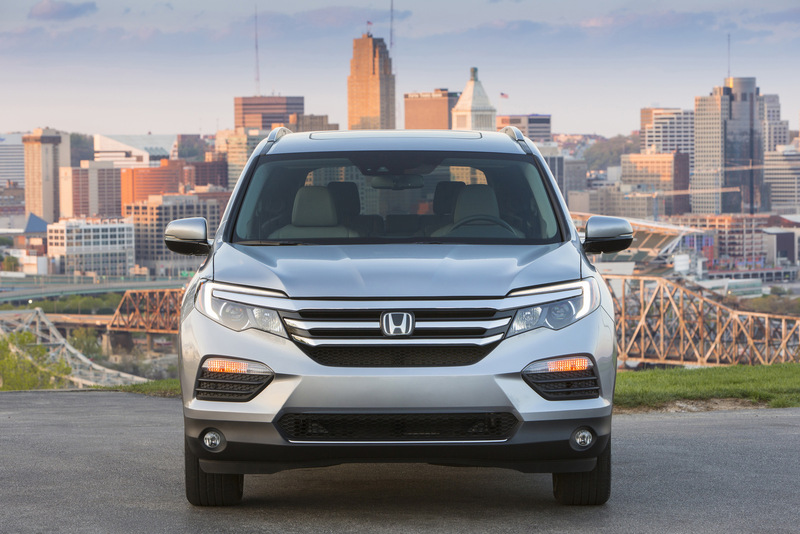 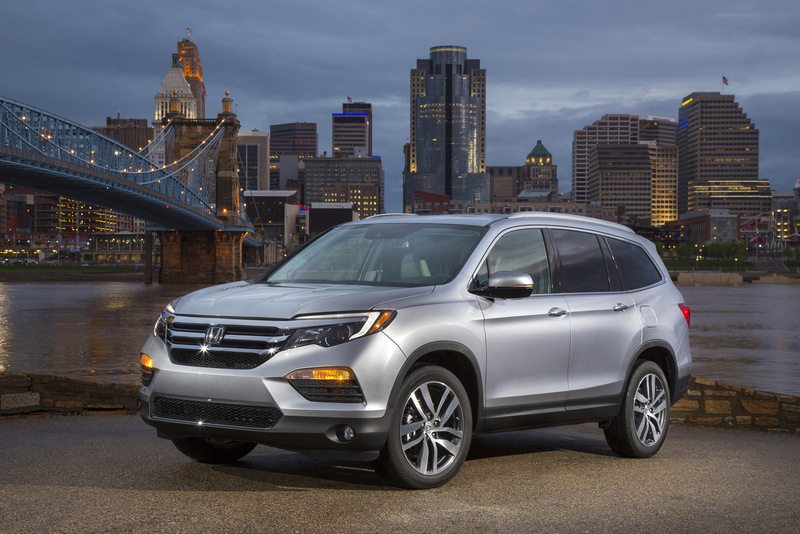 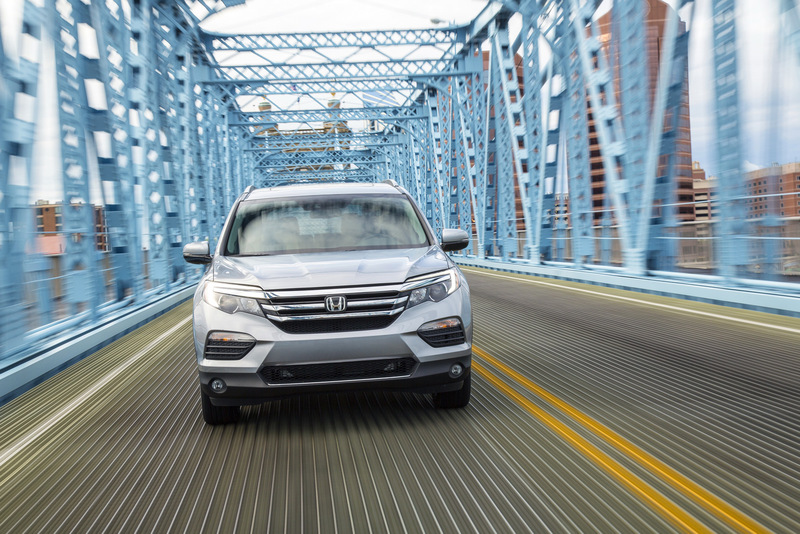 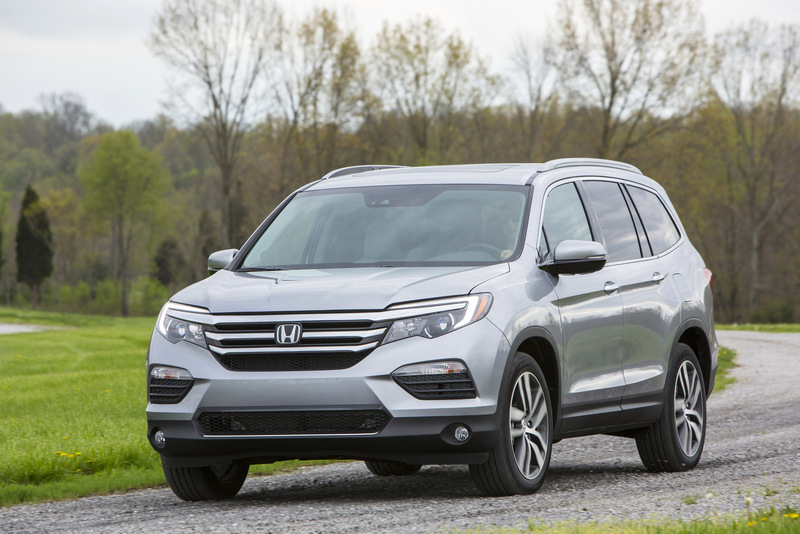 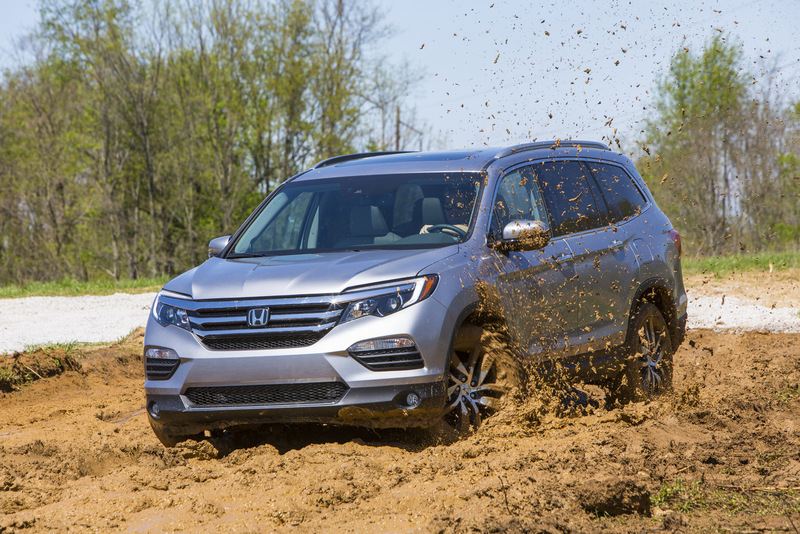 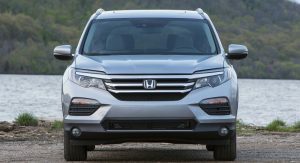 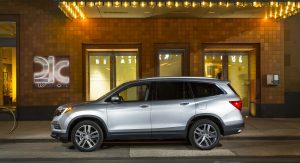 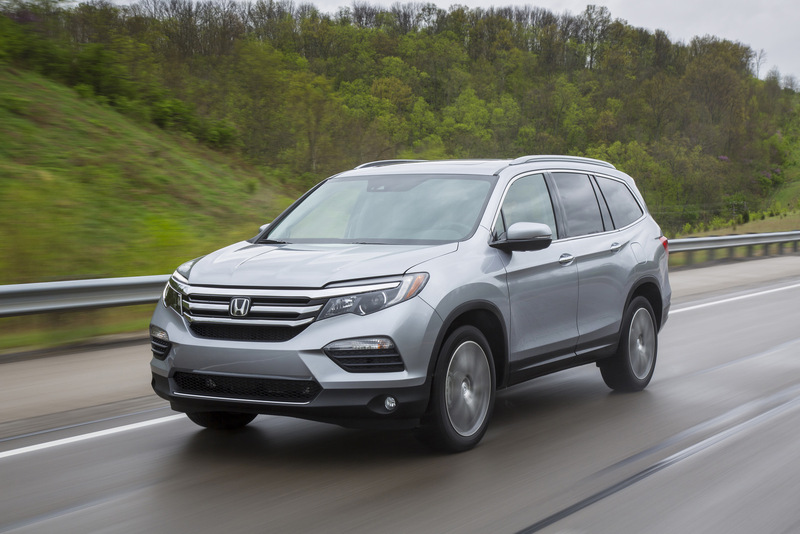 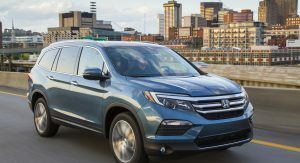 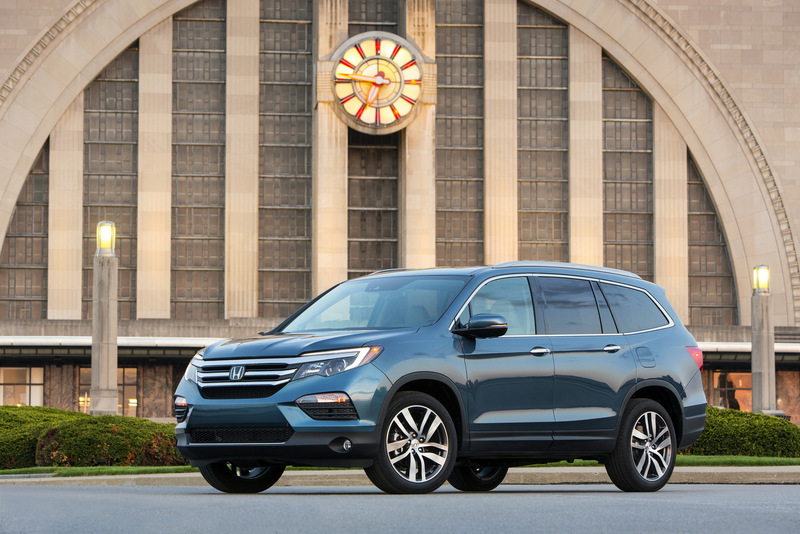 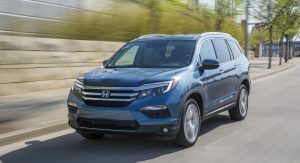 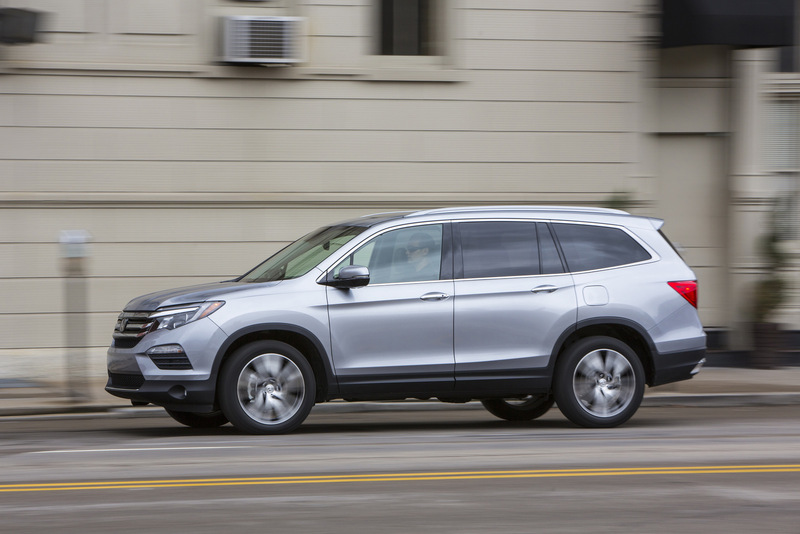 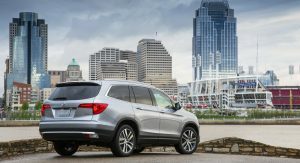 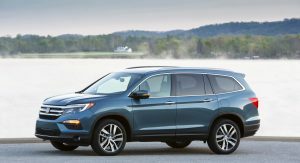 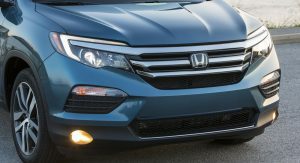 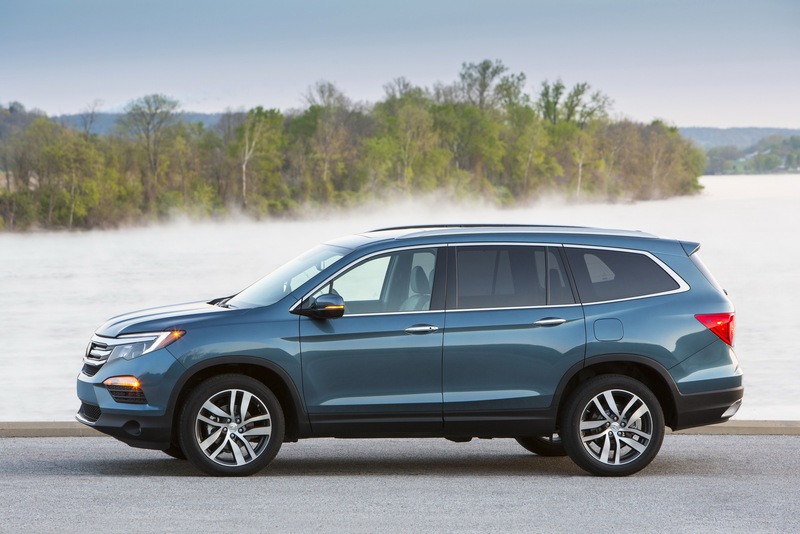 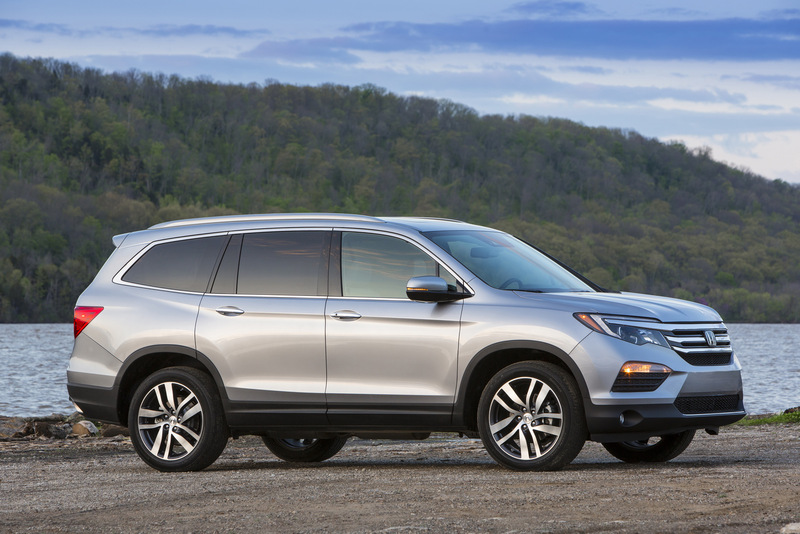 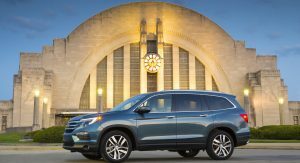 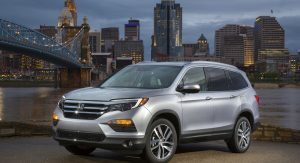 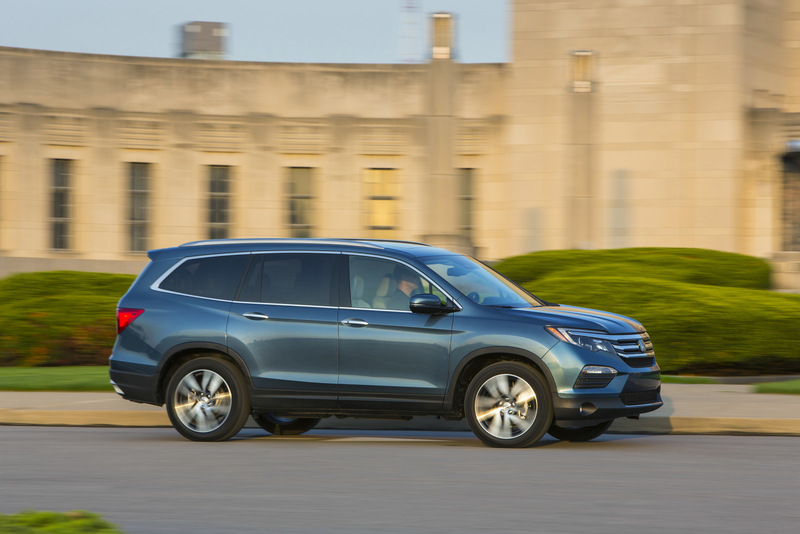 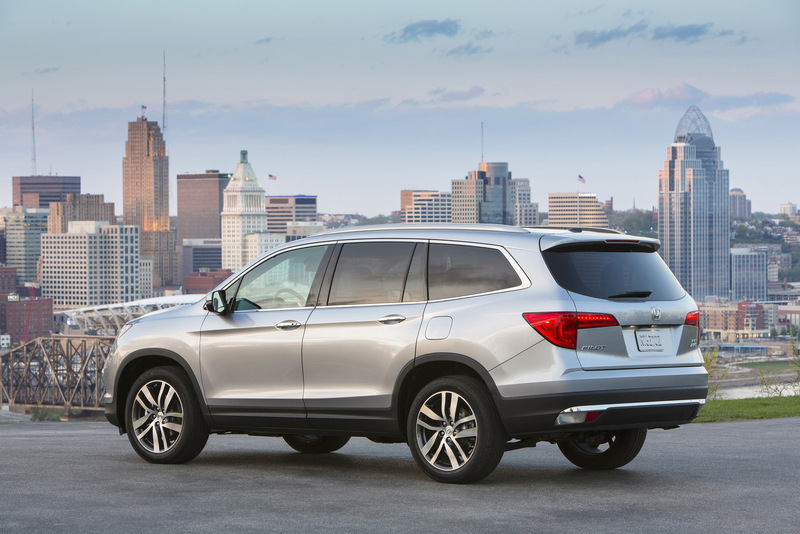 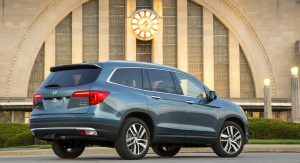 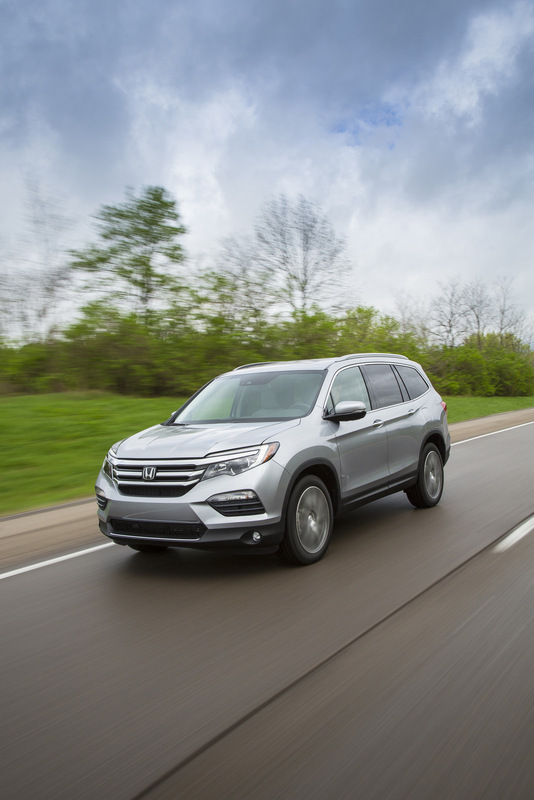 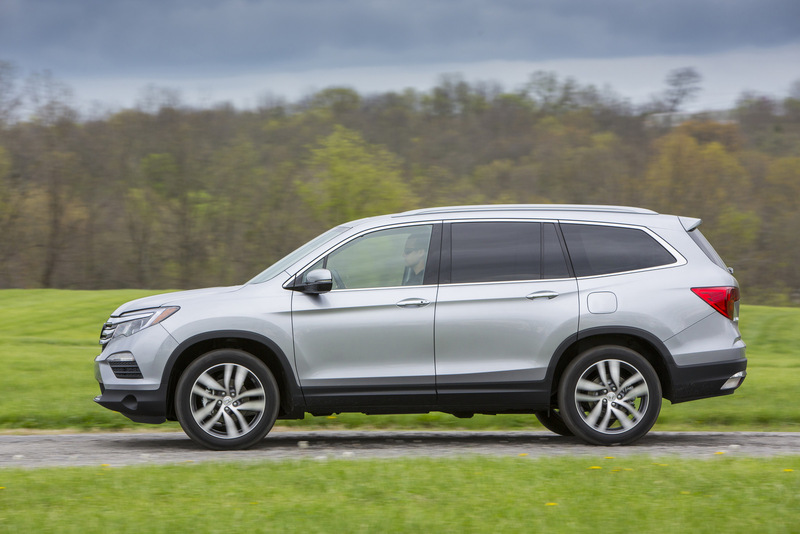 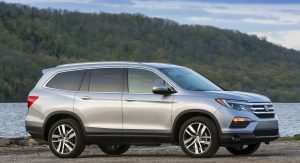 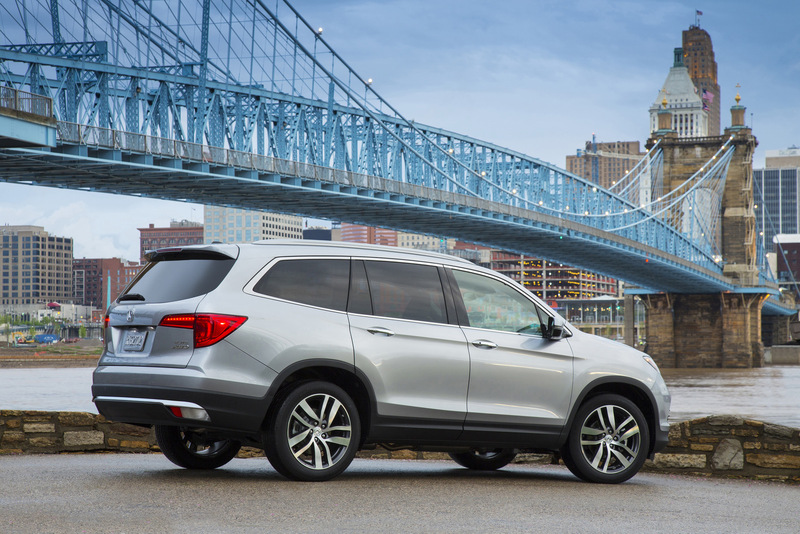 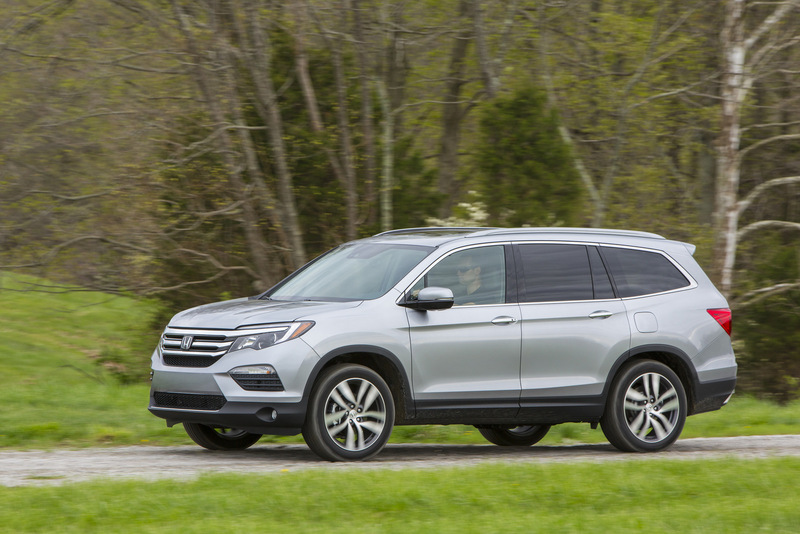 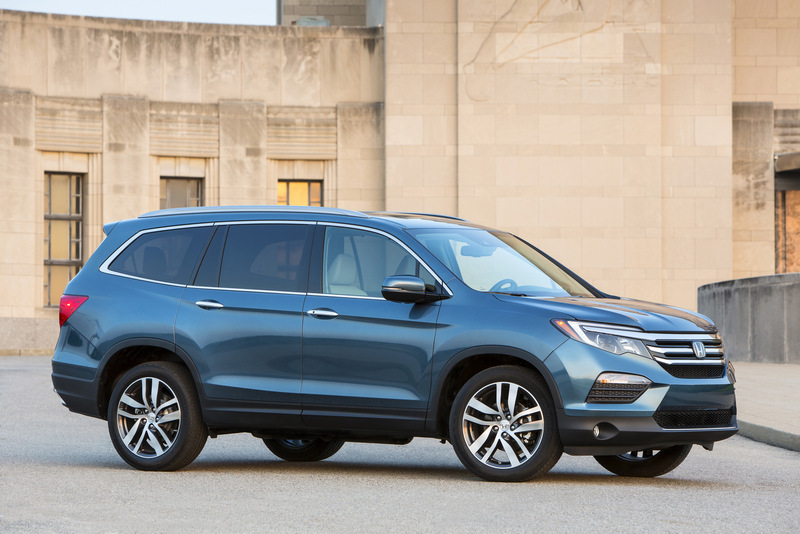 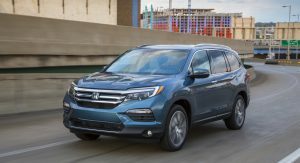 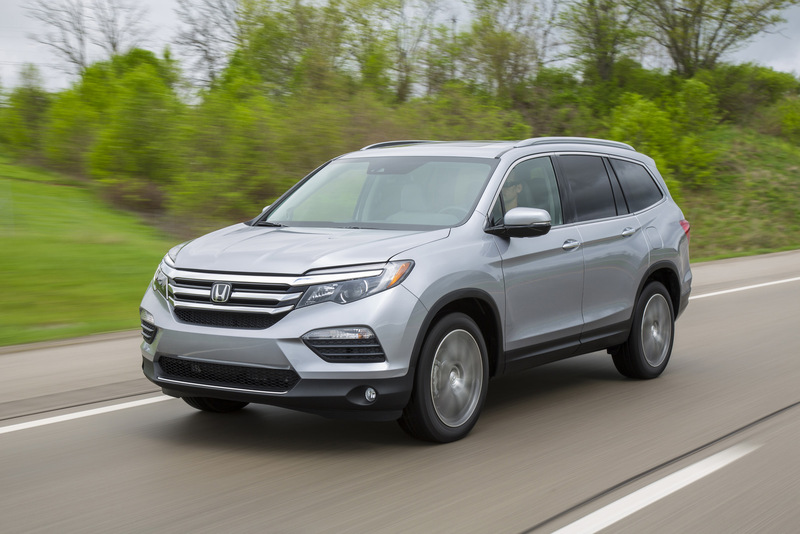 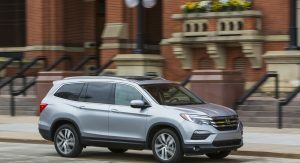 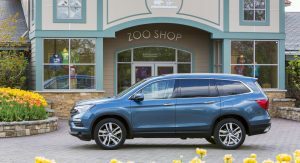 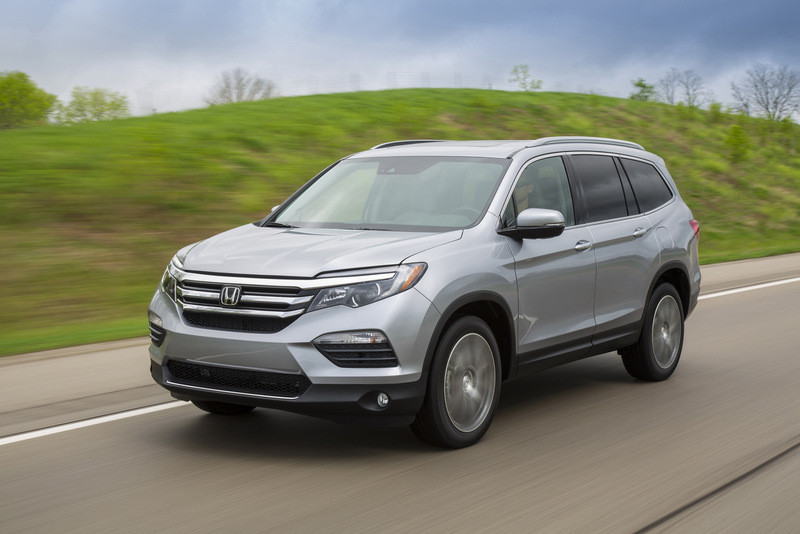 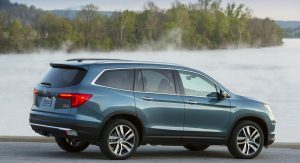 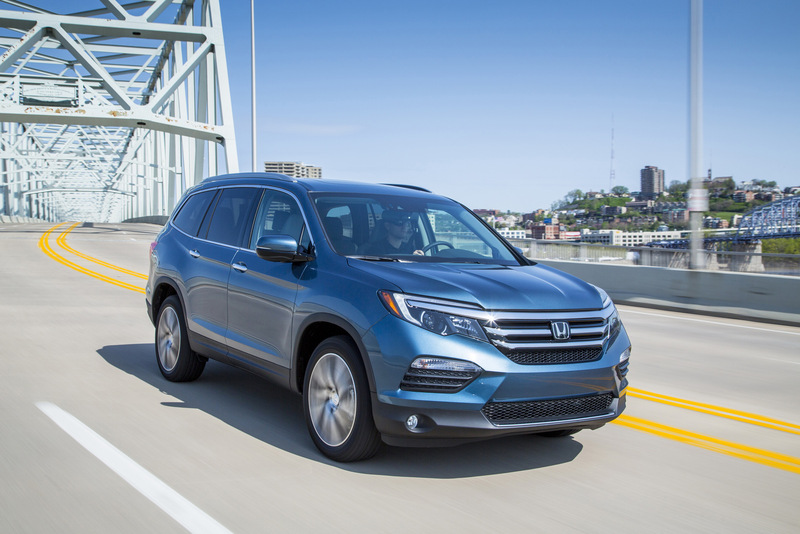 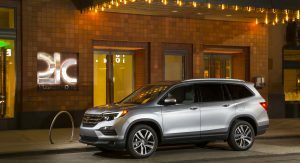 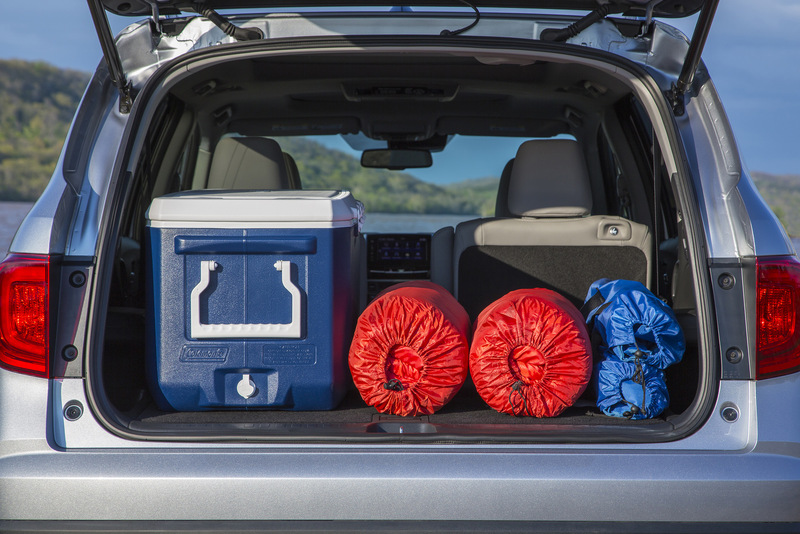 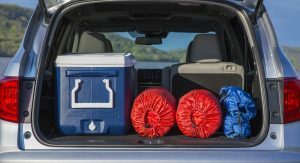 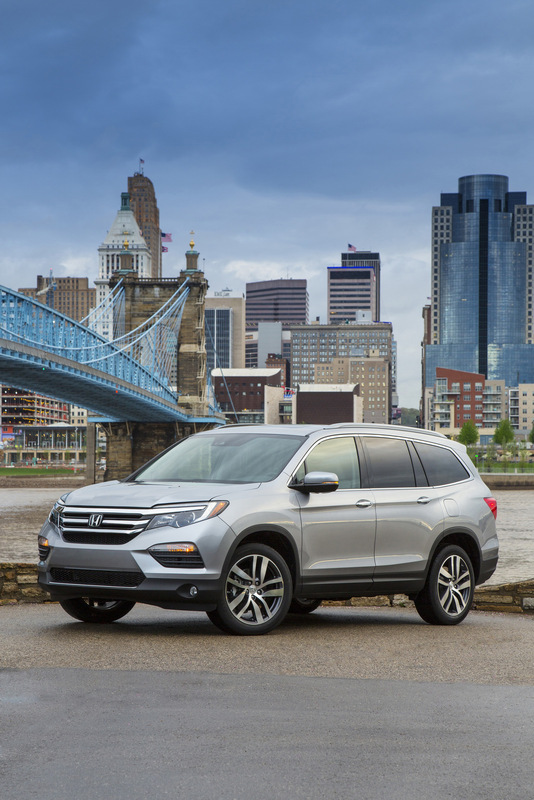 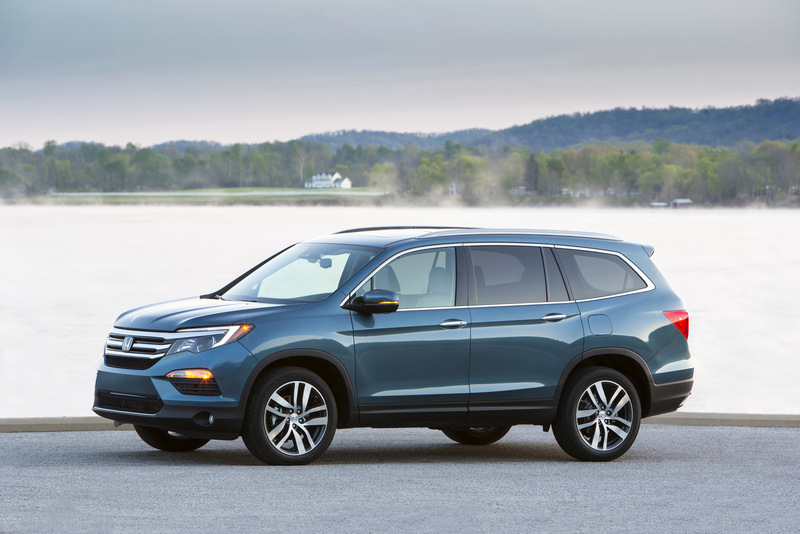 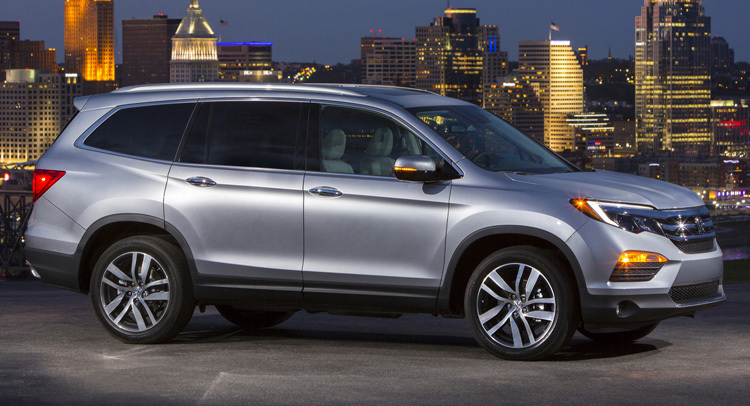 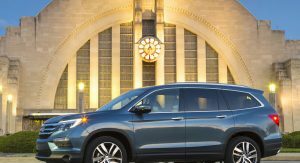 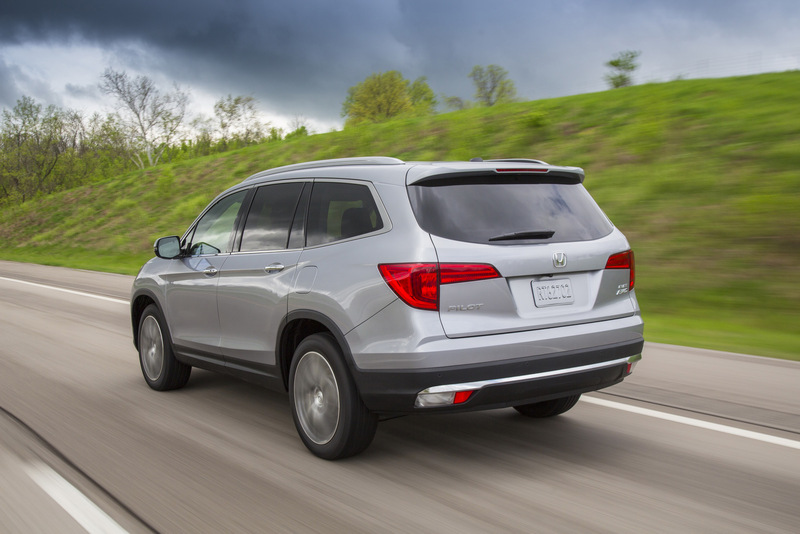 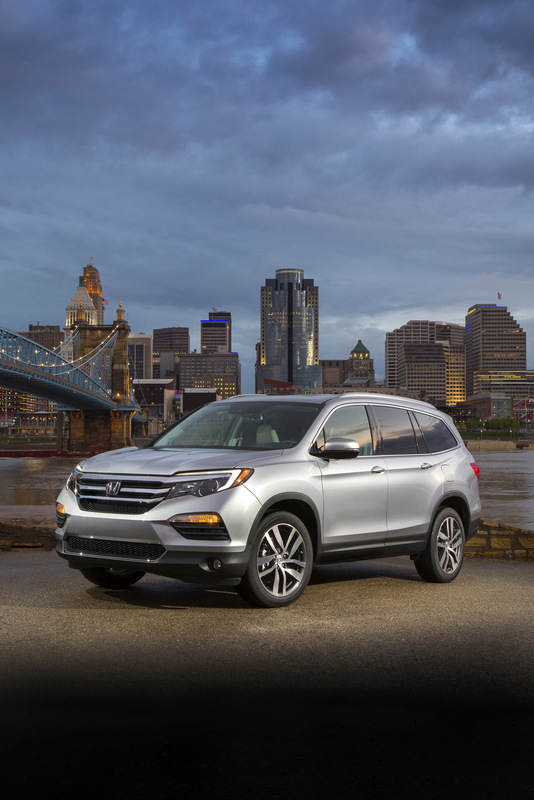 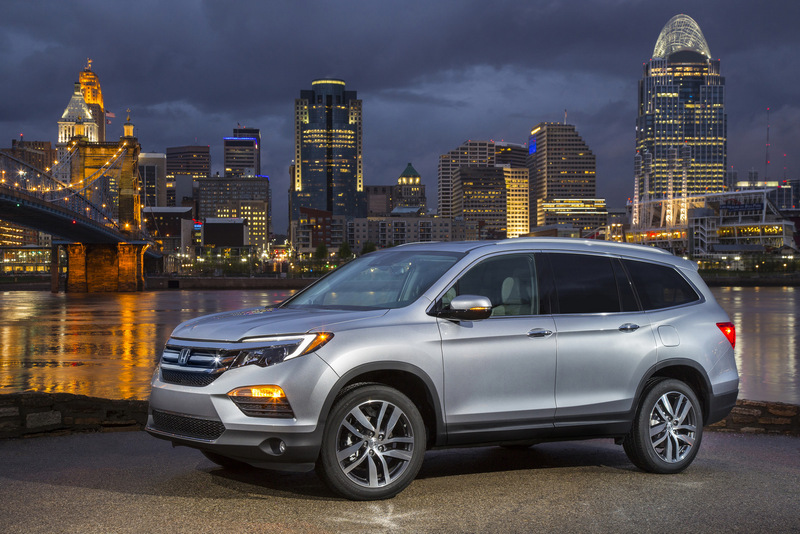 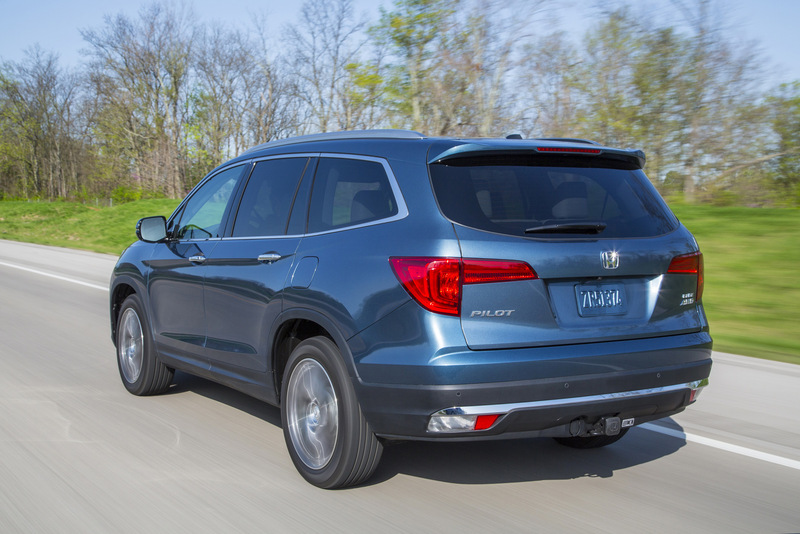 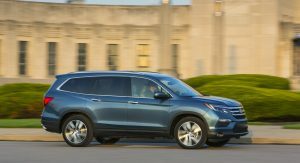 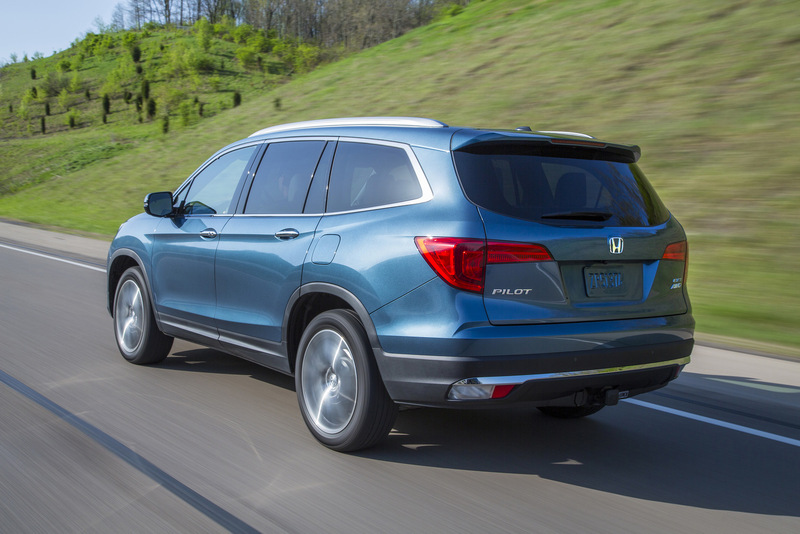 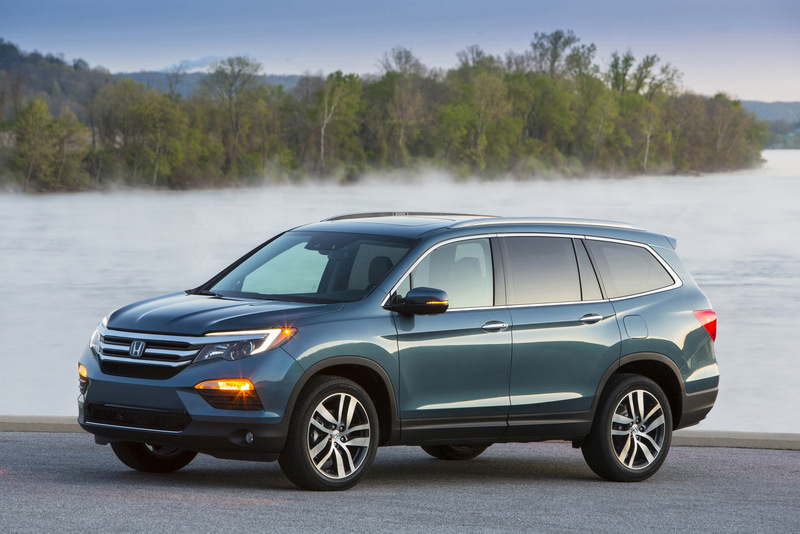 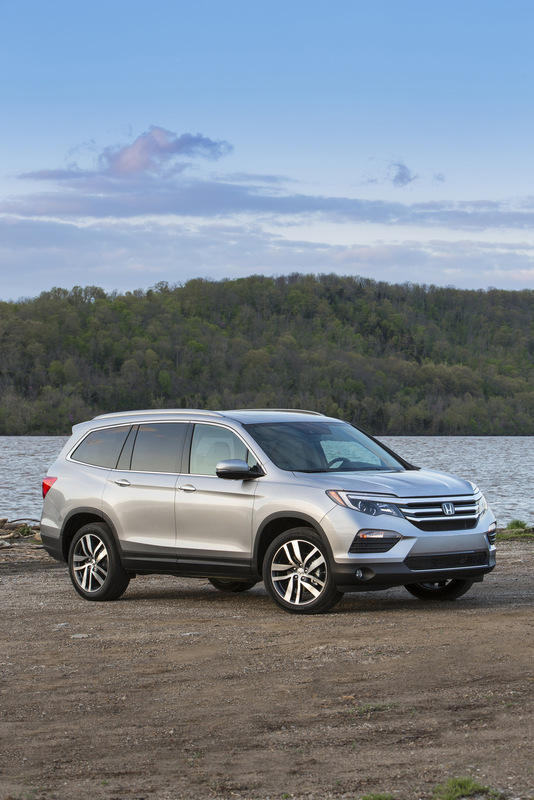 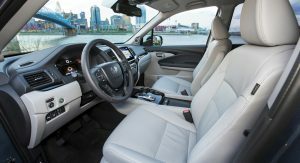 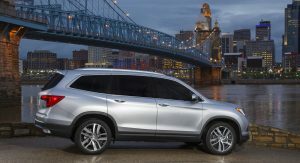 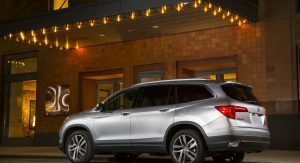 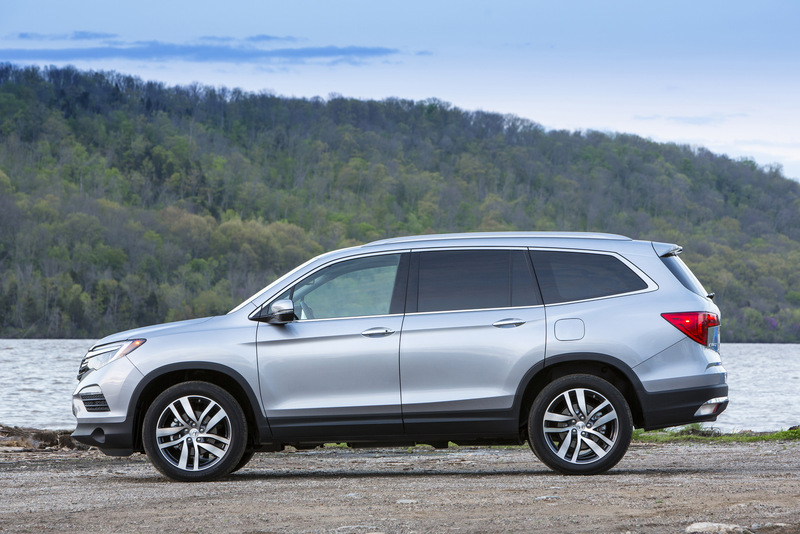 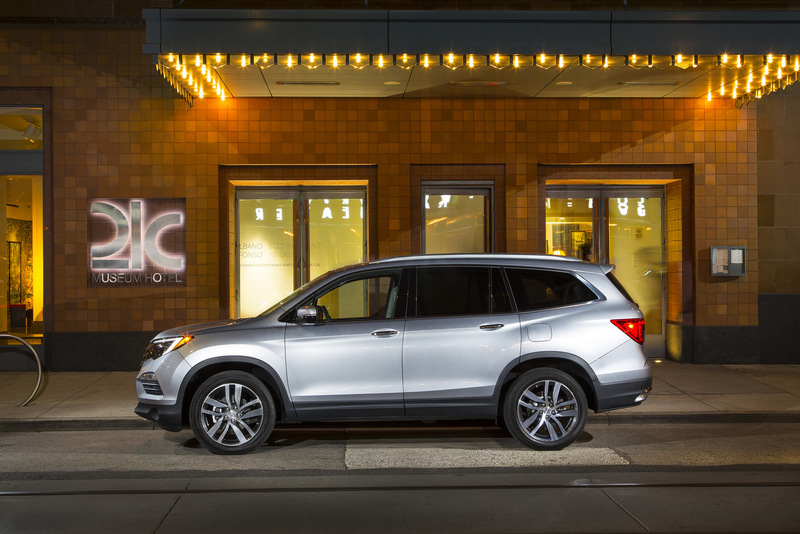 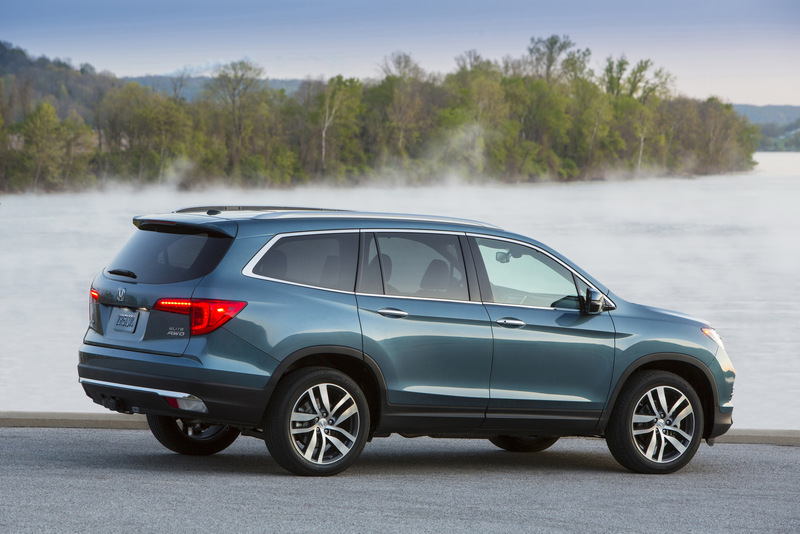 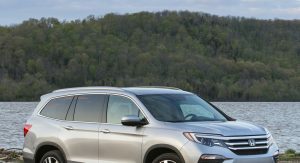 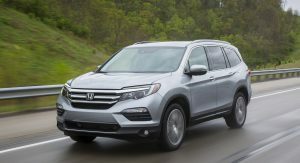 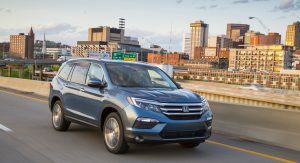 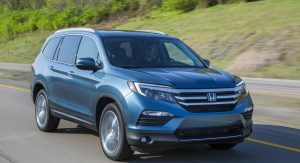 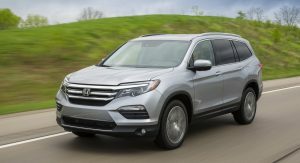 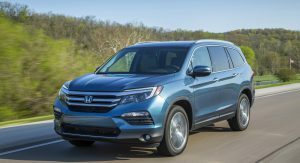 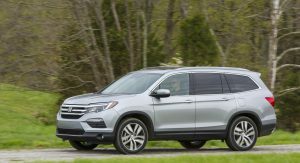 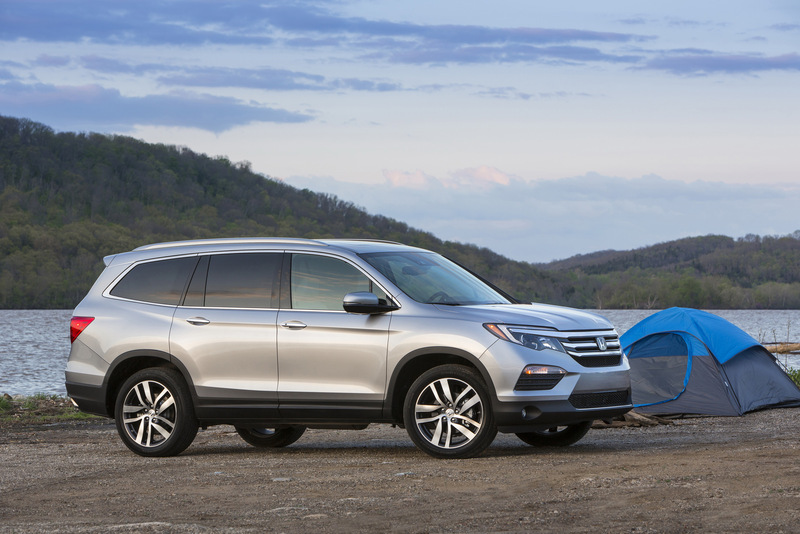 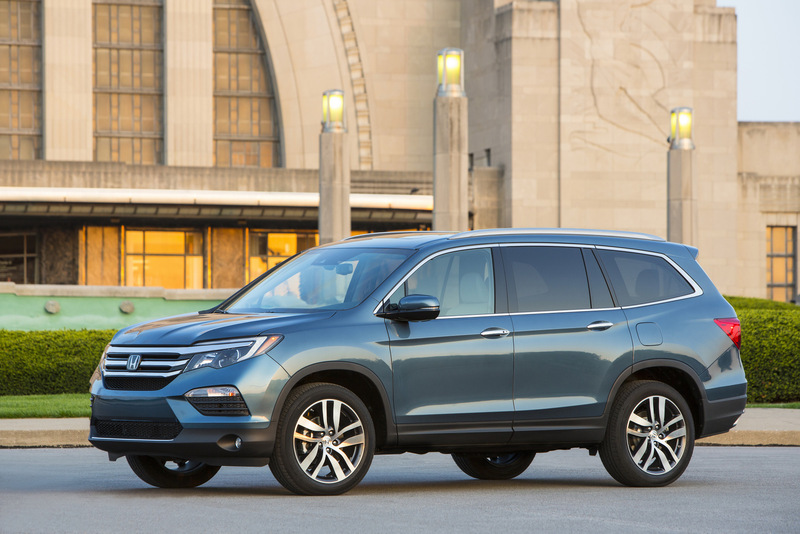 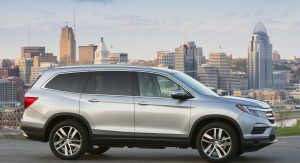 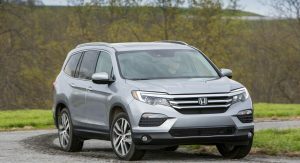 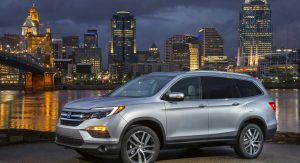 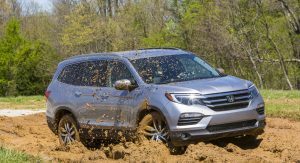 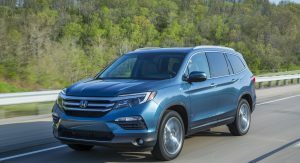 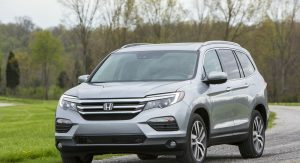 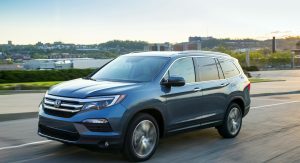 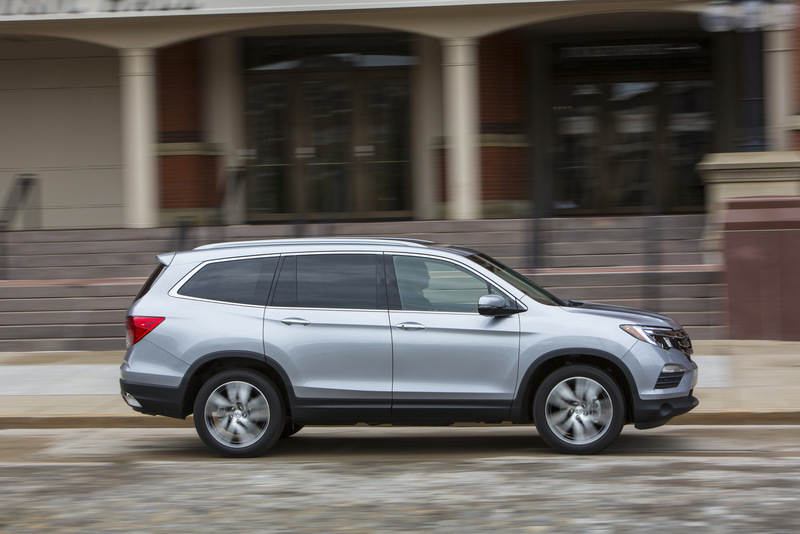 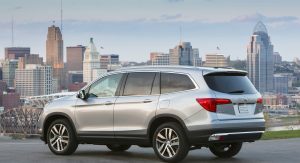 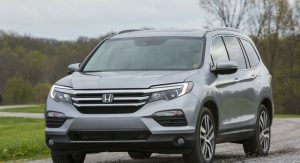 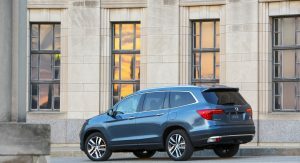 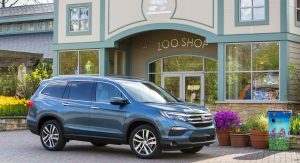 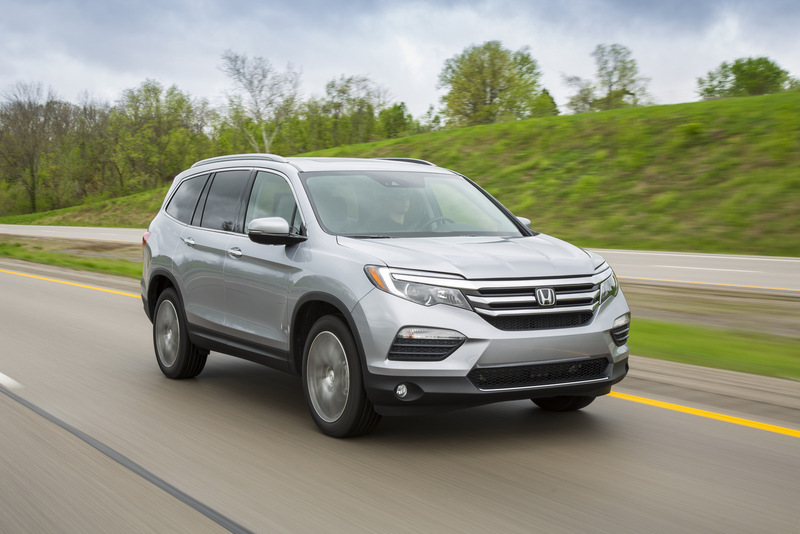 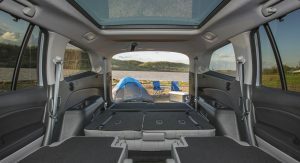 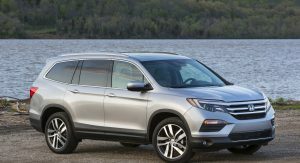 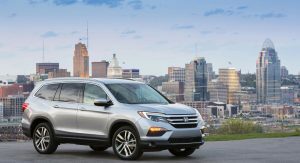 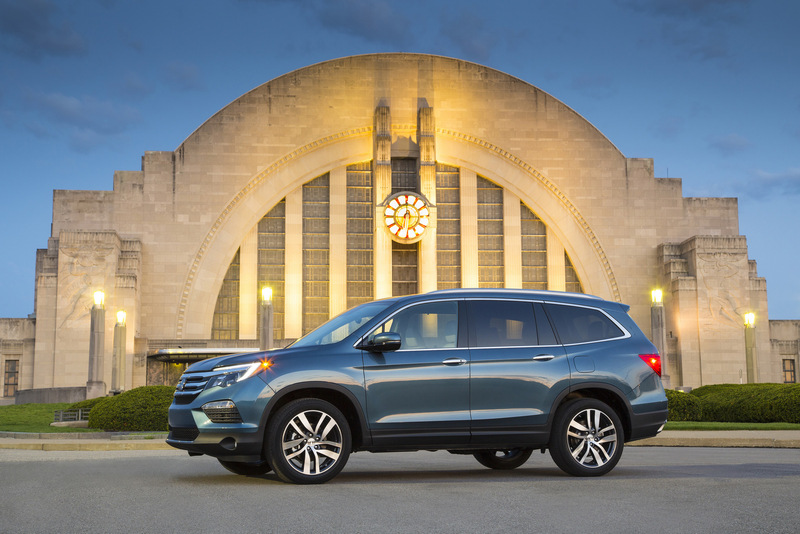 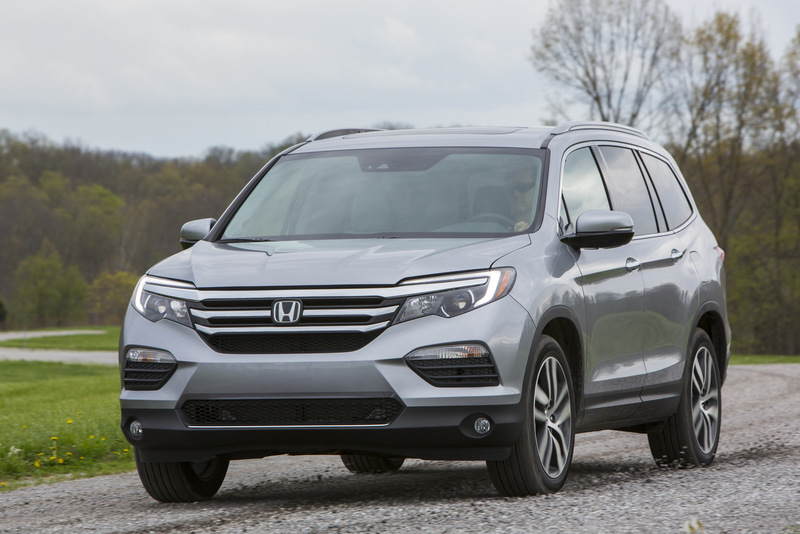 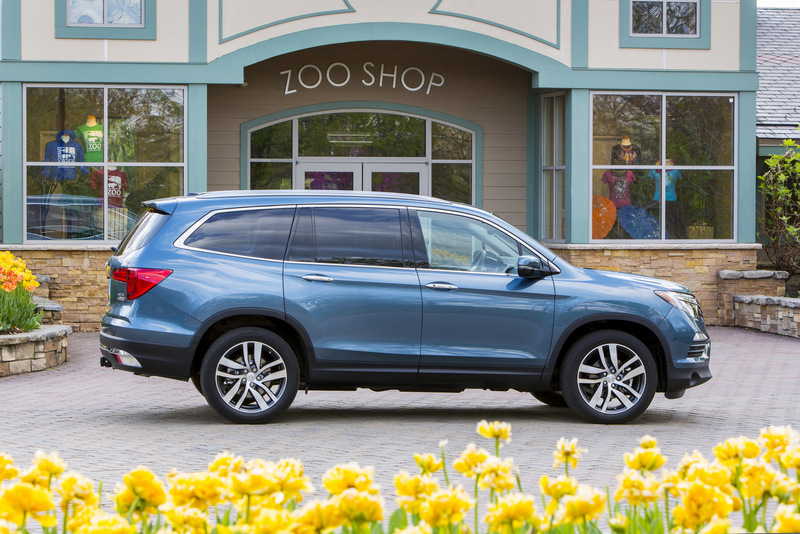 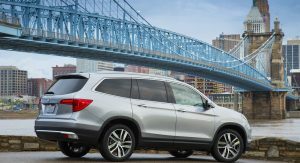 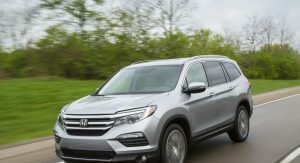 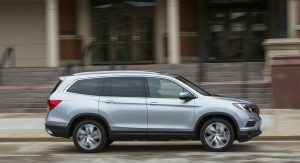 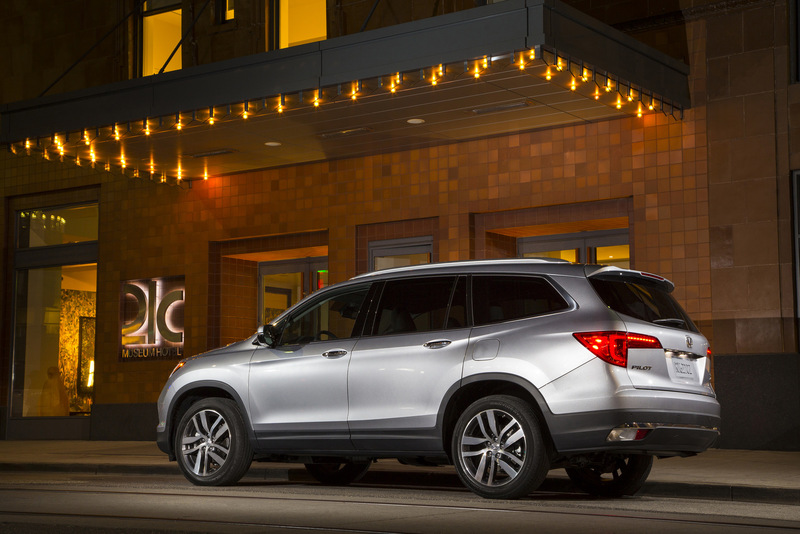 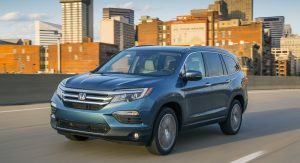 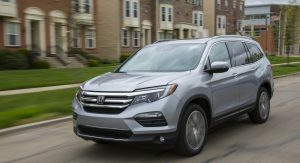 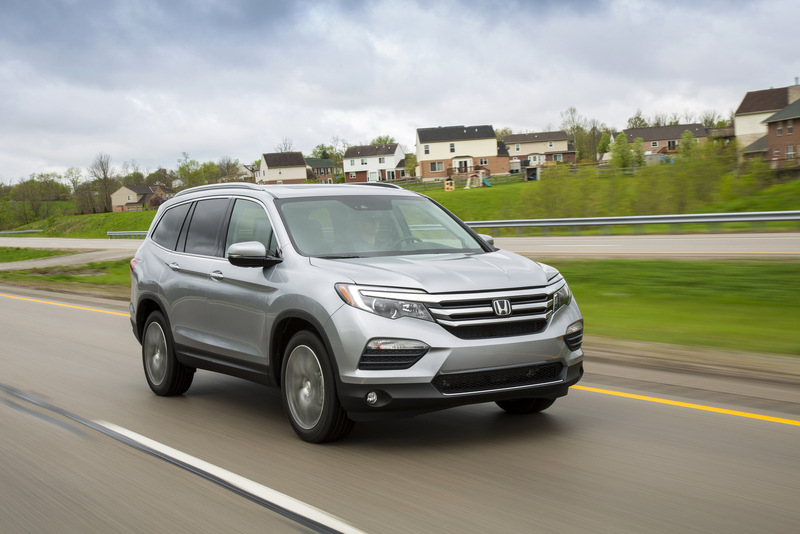 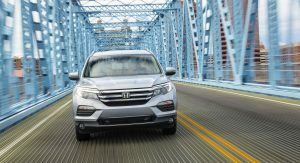 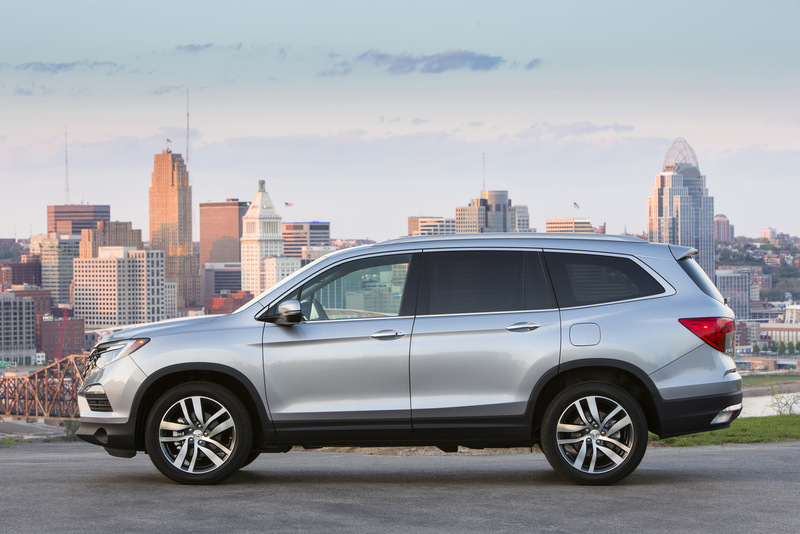 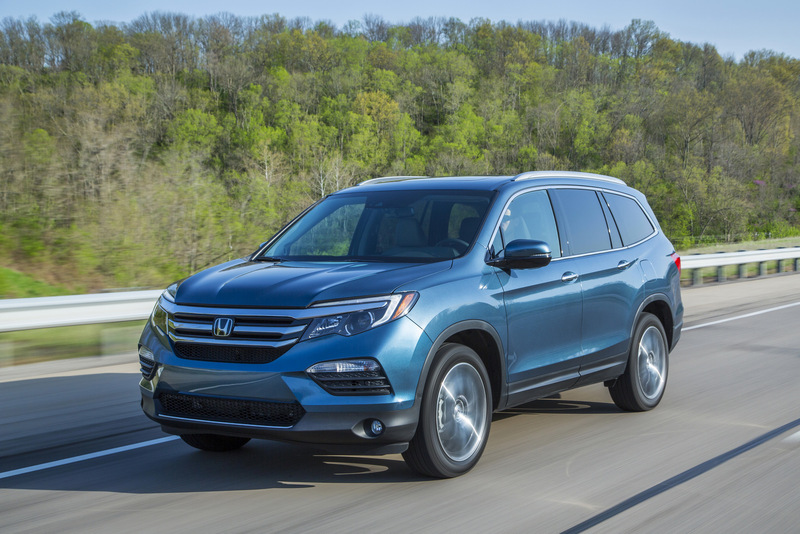 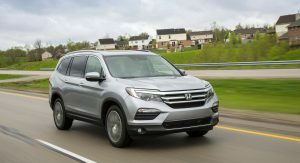 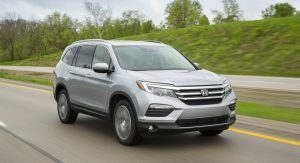 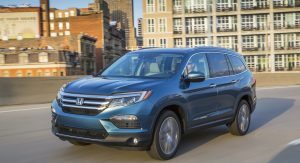 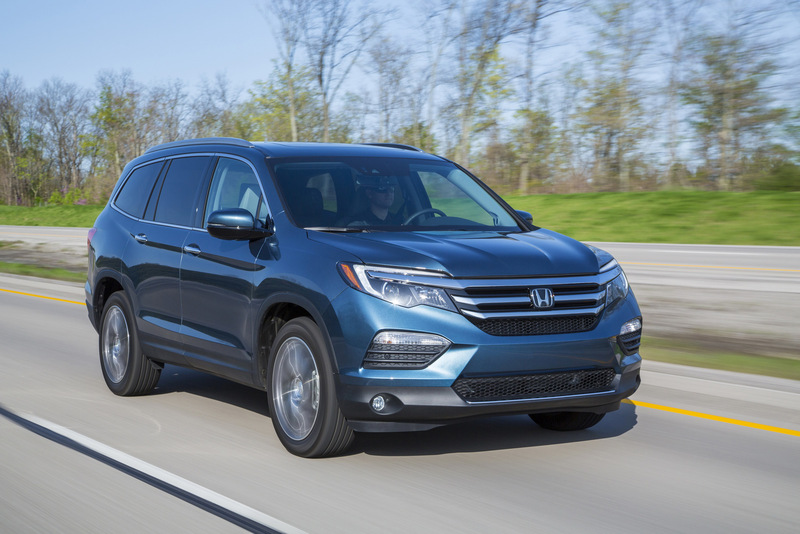 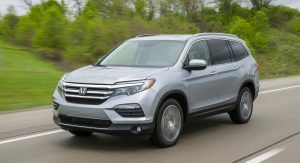 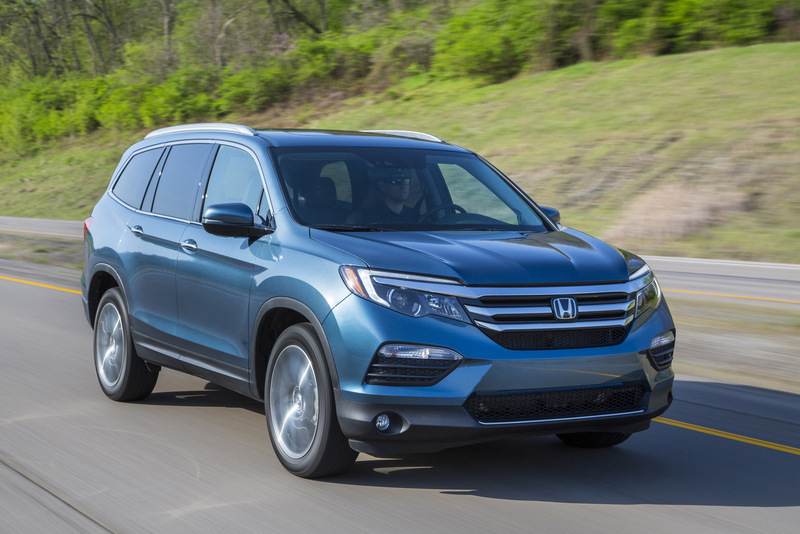 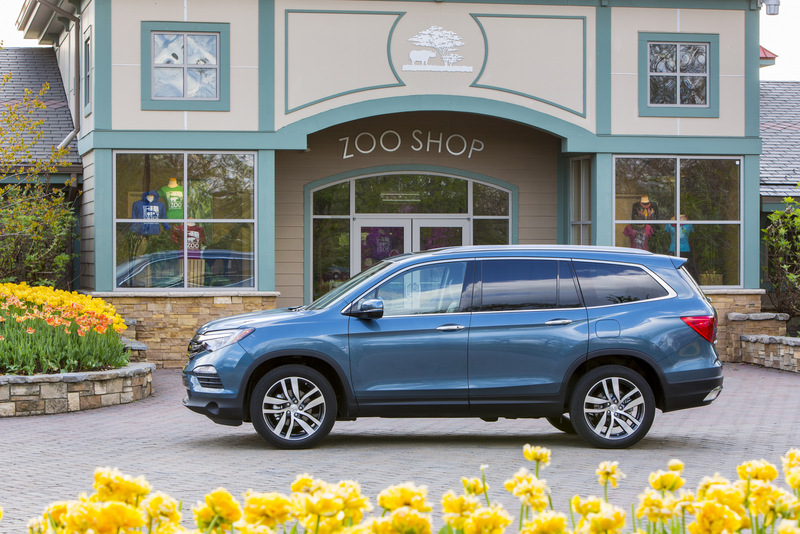 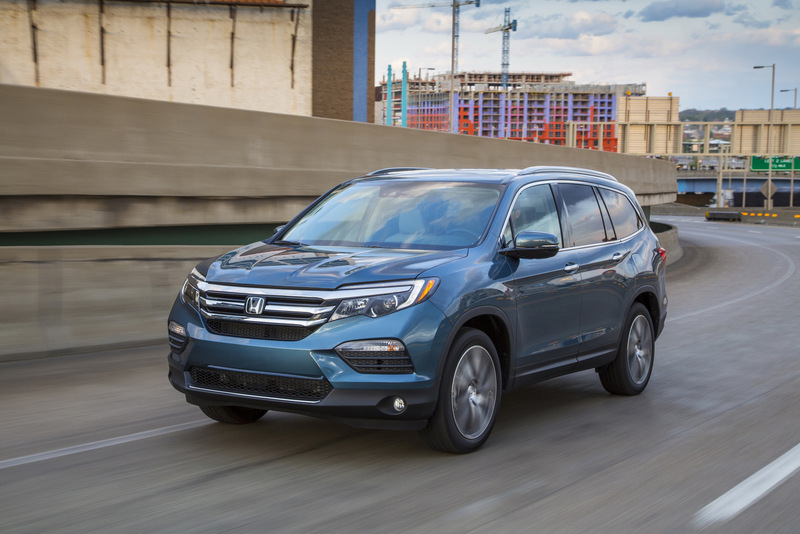 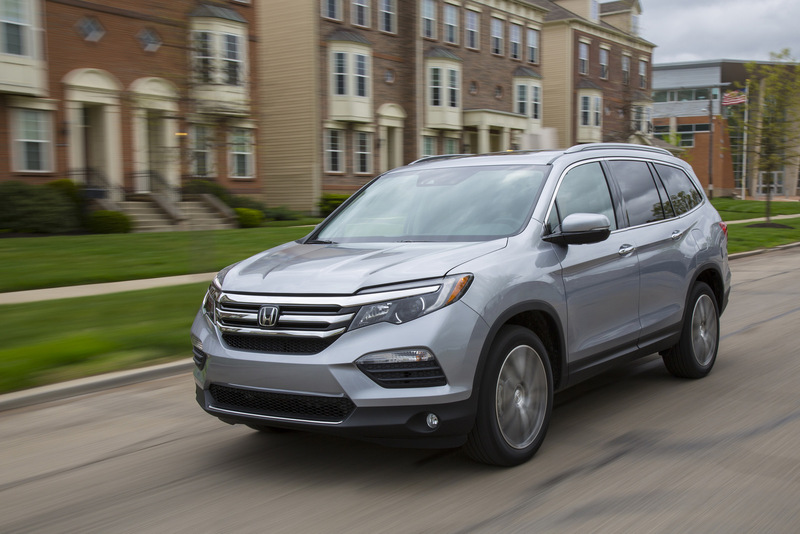 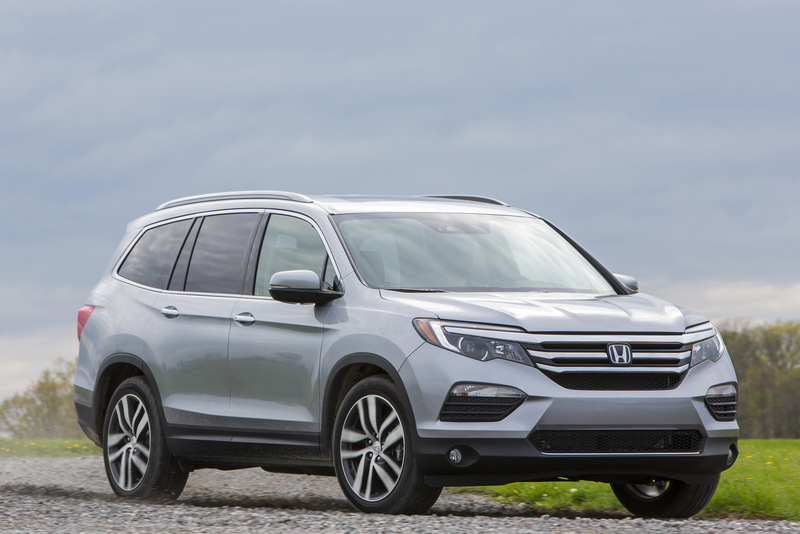 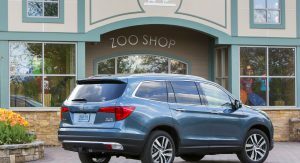 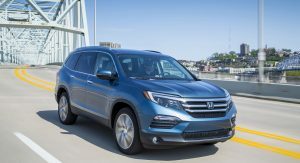 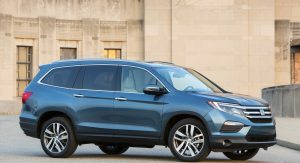 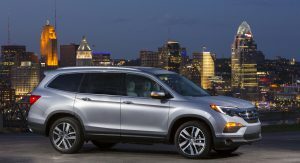 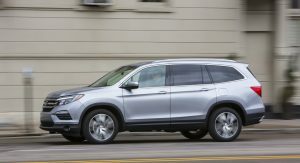 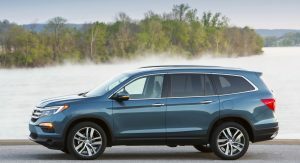 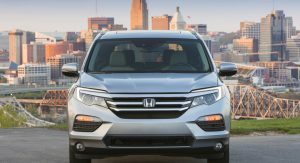 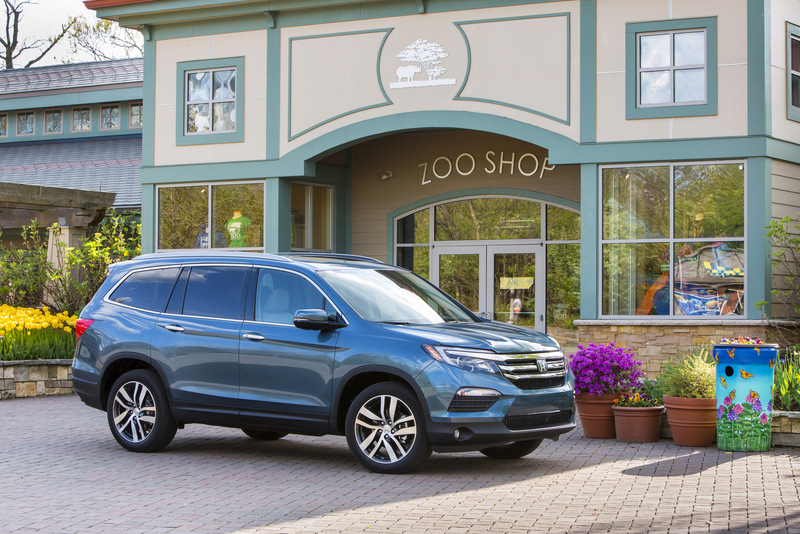 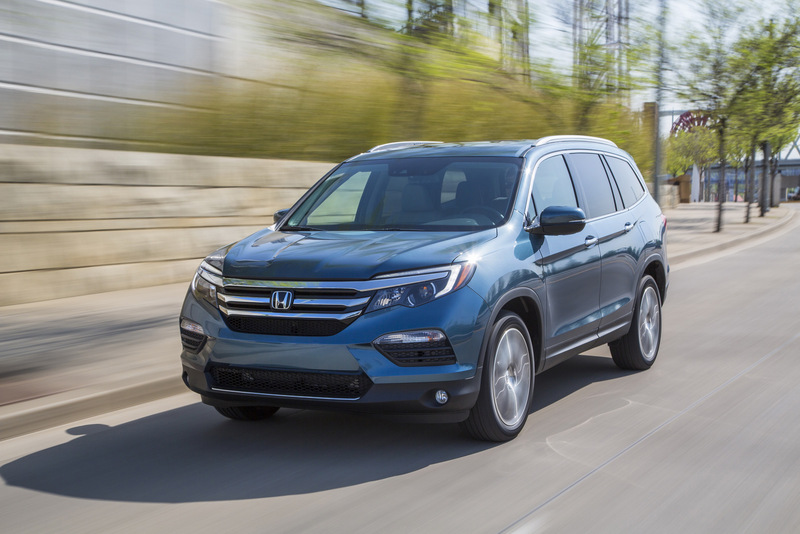 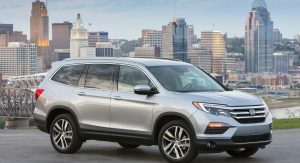 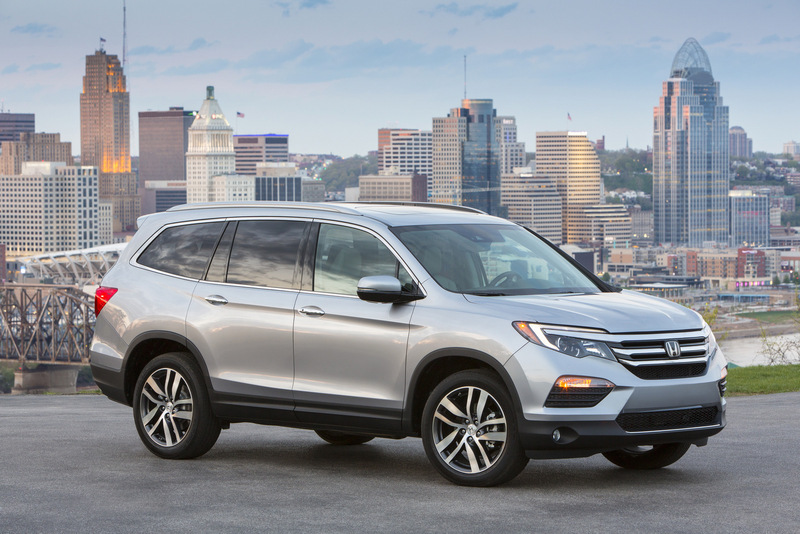 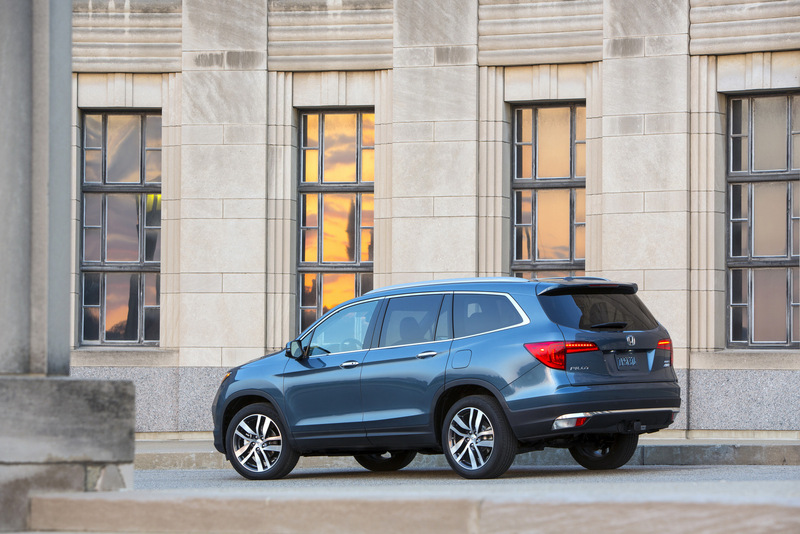 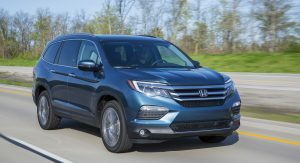 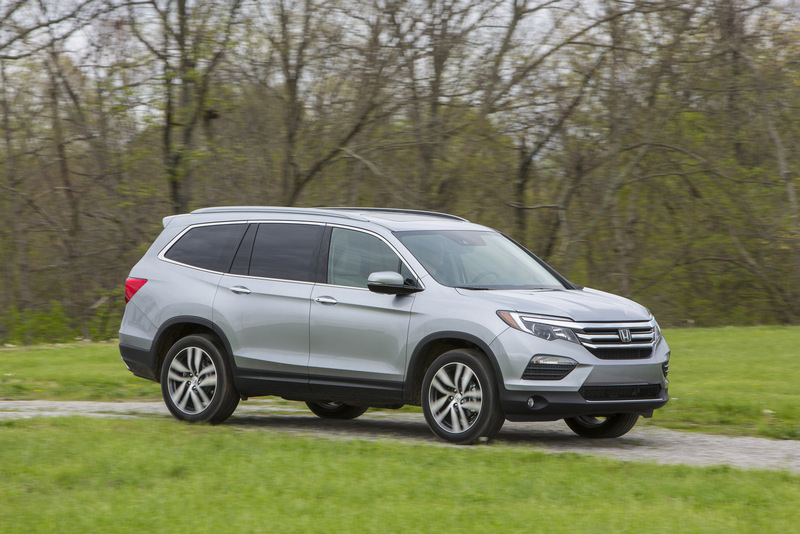 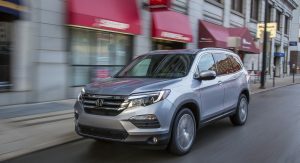 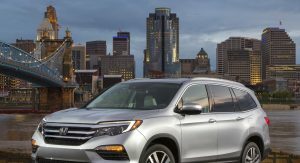 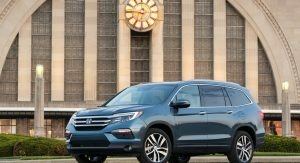 Honda has released full details and a mega photo gallery of its 2016 Pilot mid-sized SUV, which went on sale on June 18 across the United States with a $29,995 starting price (excluding $880 destination). 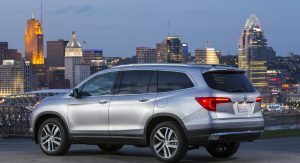 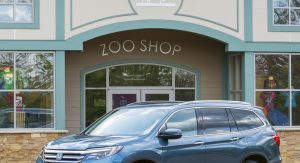 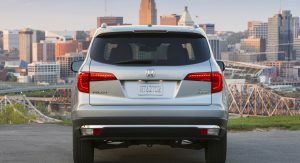 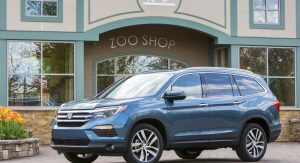 The all-new Honda Pilot is offered with a single engine option, a 3.5-liter i-VTEC V6 gasoline engine which produces 280hp and 262lb-ft (355Nm) of torque. 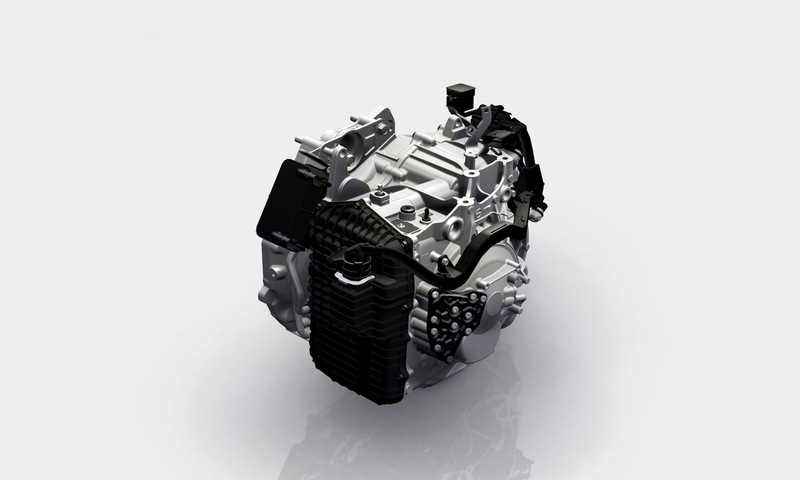 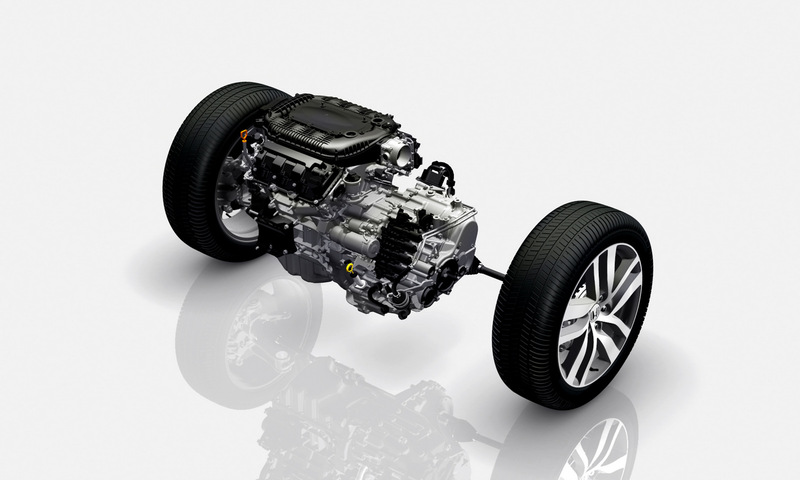 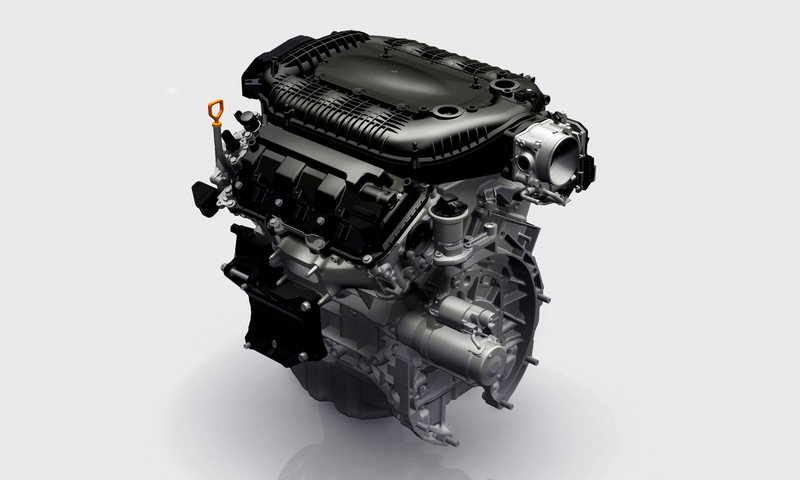 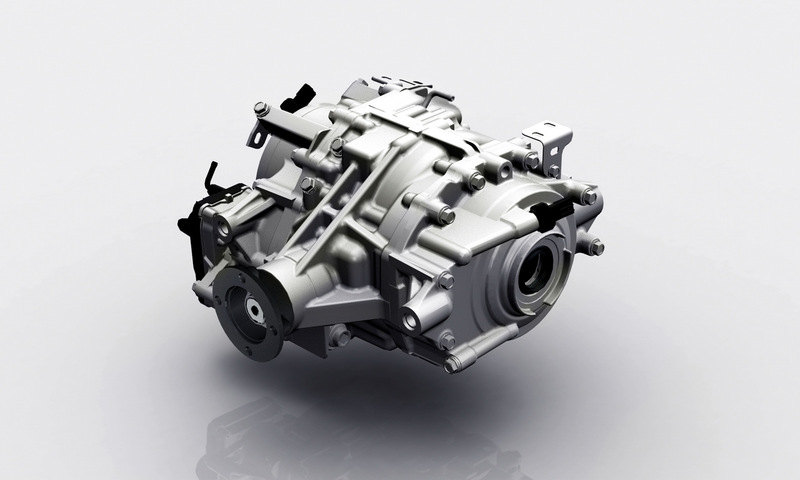 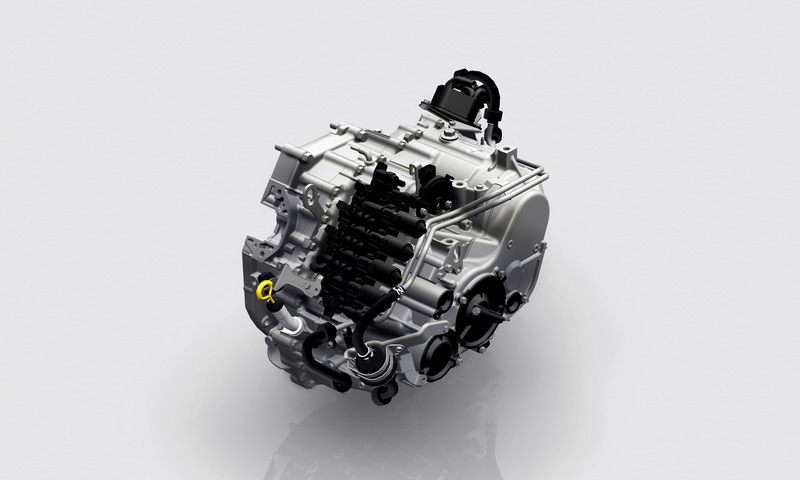 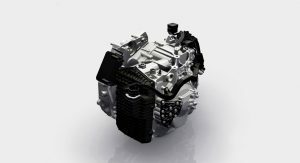 The unit can be mated to either a standard six-speed automatic or an optional 9-speed automatic transmission. 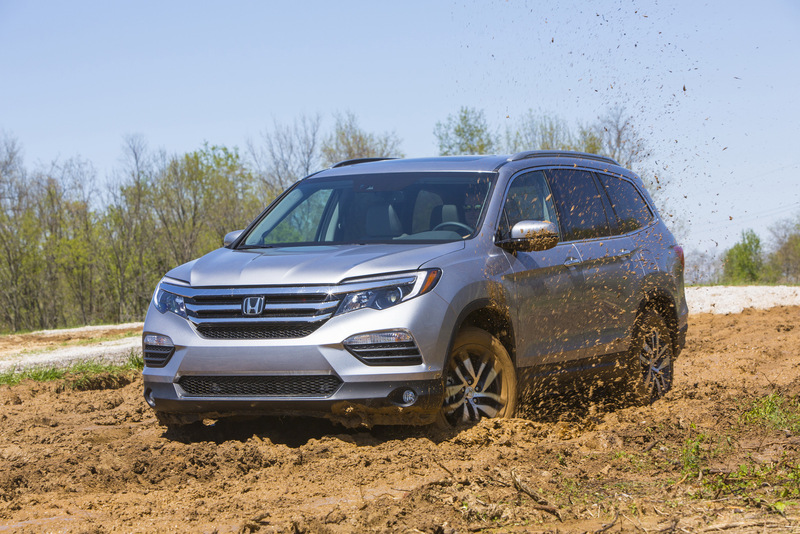 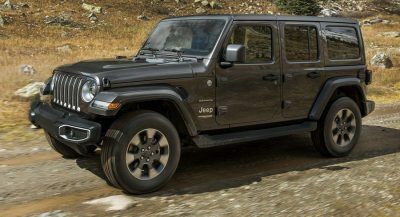 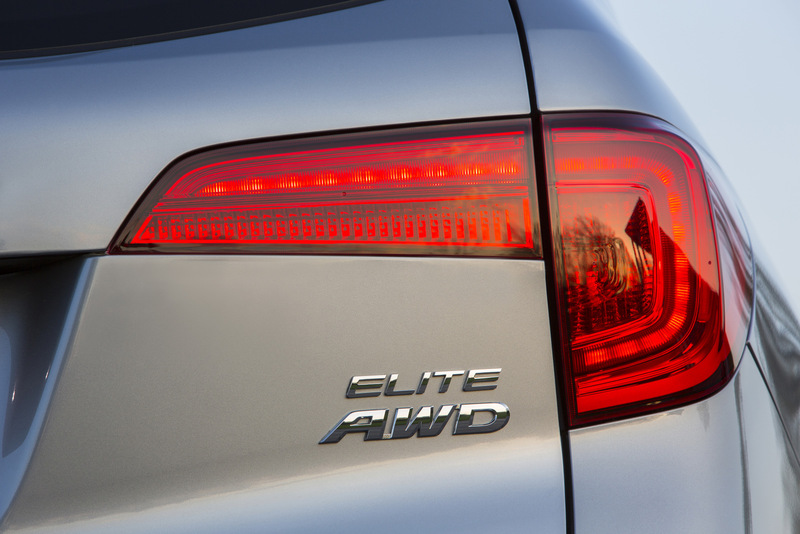 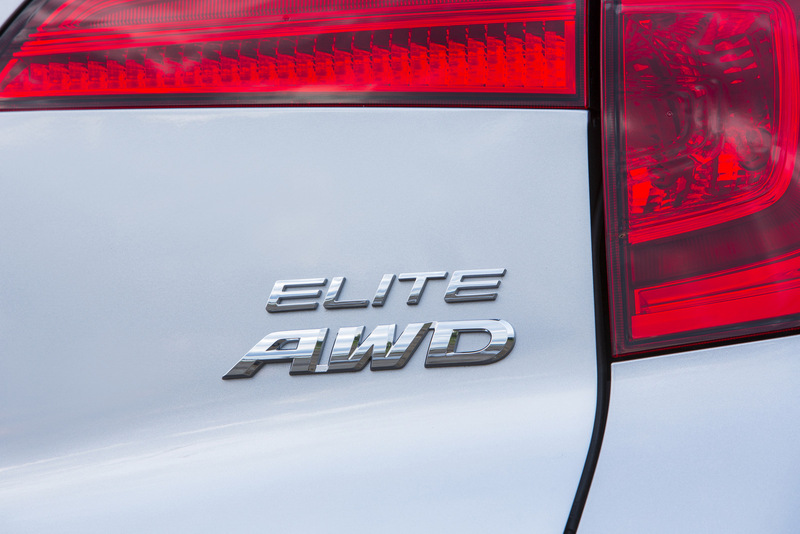 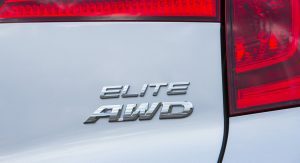 Available in 2WD or 4WD versions, the new Pilot returns an EPA-estimated combined fuel economy rating of 23 mpg (10.2 l/100 km) for the two-wheel drive model with the 9-speed auto, an improvement of 2 mpg over the 2015 model. 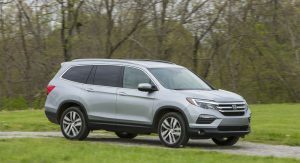 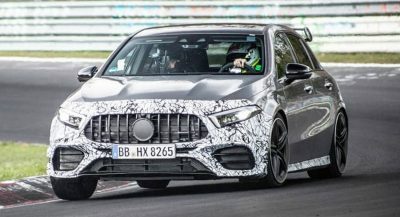 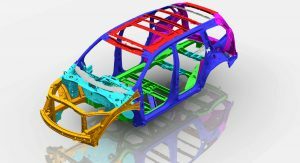 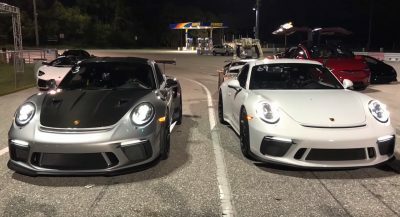 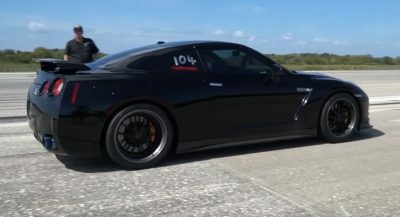 That’s in part due to a significant weight reduction over the previous generation Pilot (nearly 300 lbs/136 kg on upper trims), improved aerodynamics and reduced running resistance. 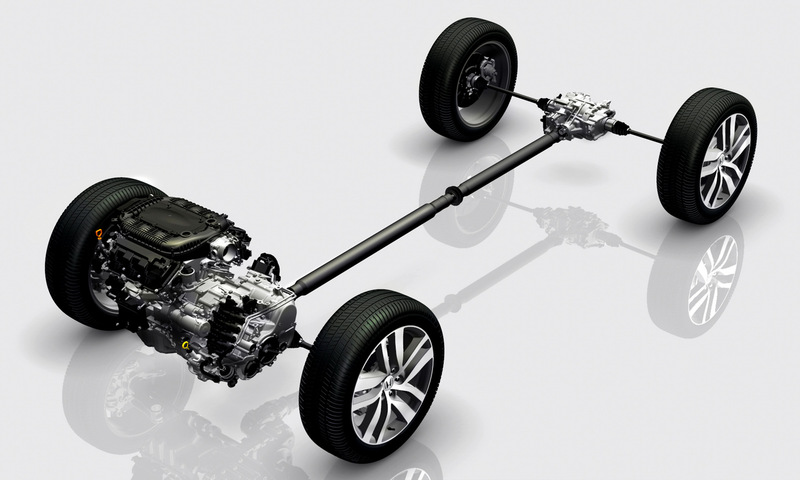 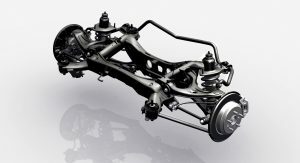 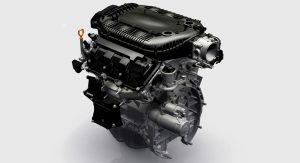 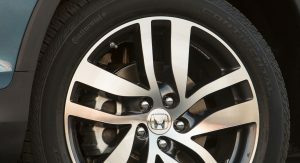 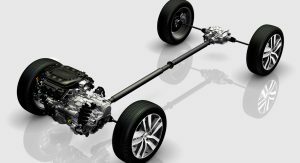 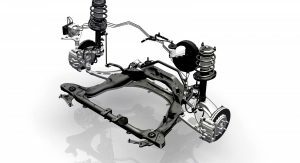 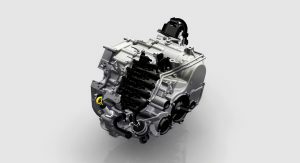 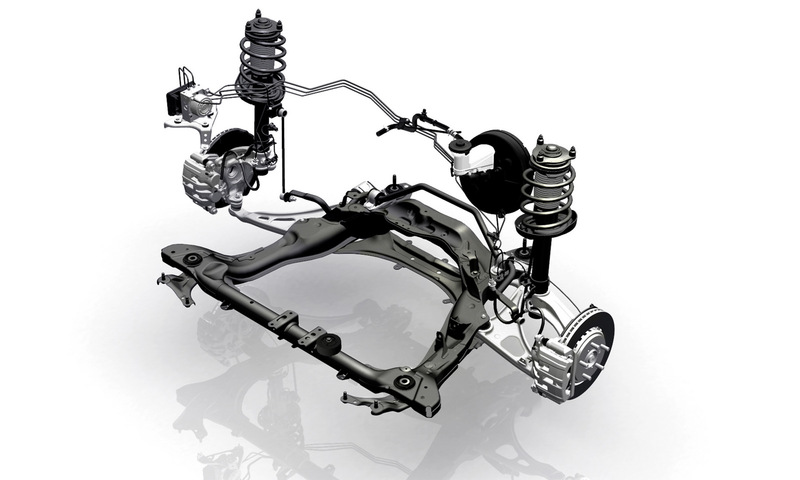 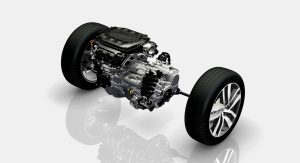 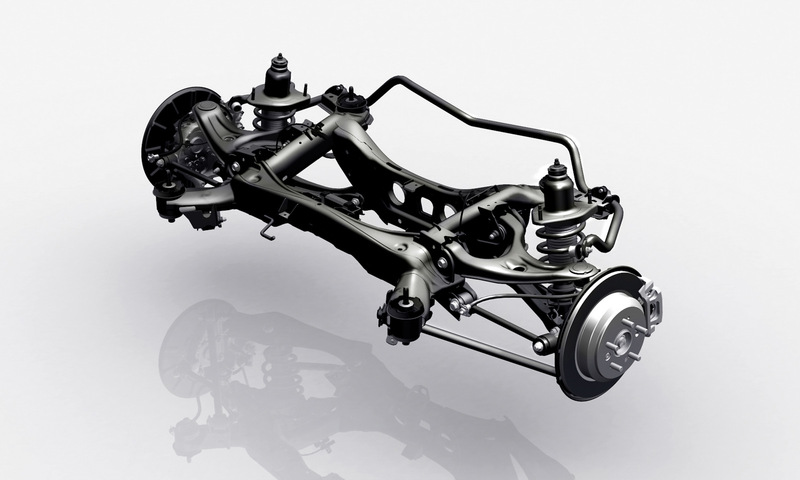 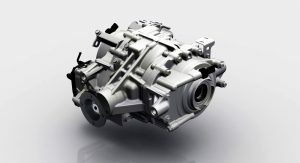 The optional Intelligent Variable Torque Management (i-VTM4) all-wheel drive system both improves traction in a variety of driving conditions and enhances dynamic driving agility thanks to torque vectoring technology, which distributes engine torque between the left and right rear wheels. 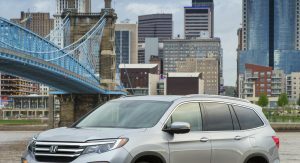 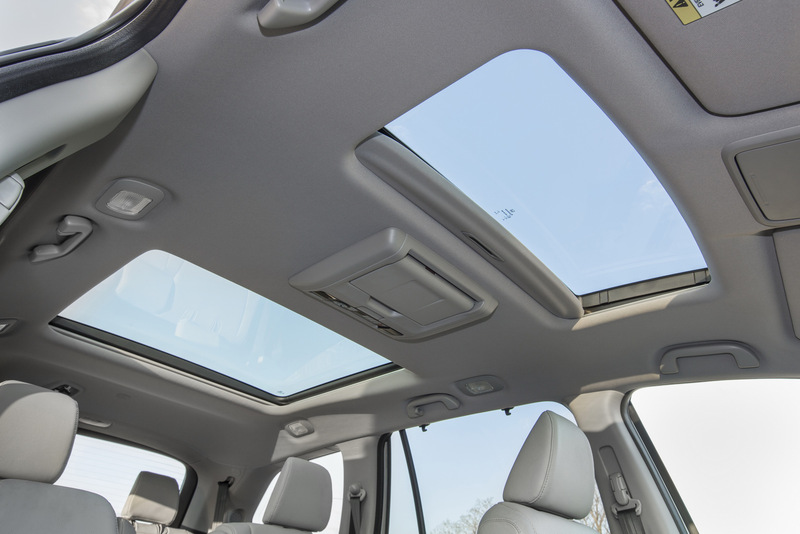 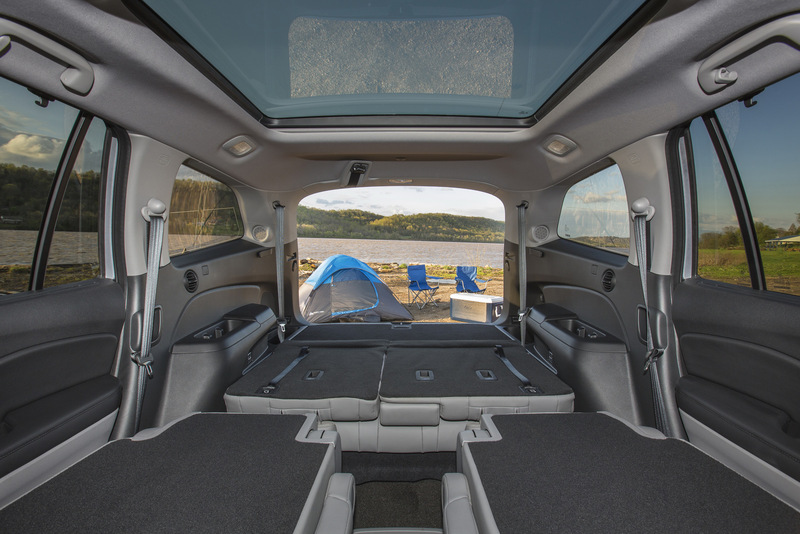 Offering seating for up to eight passengers, the 2016 Pilot features upgrades in interior quality and more standard comfort and convenience features on all trims. 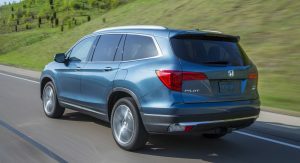 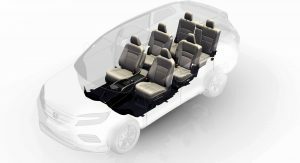 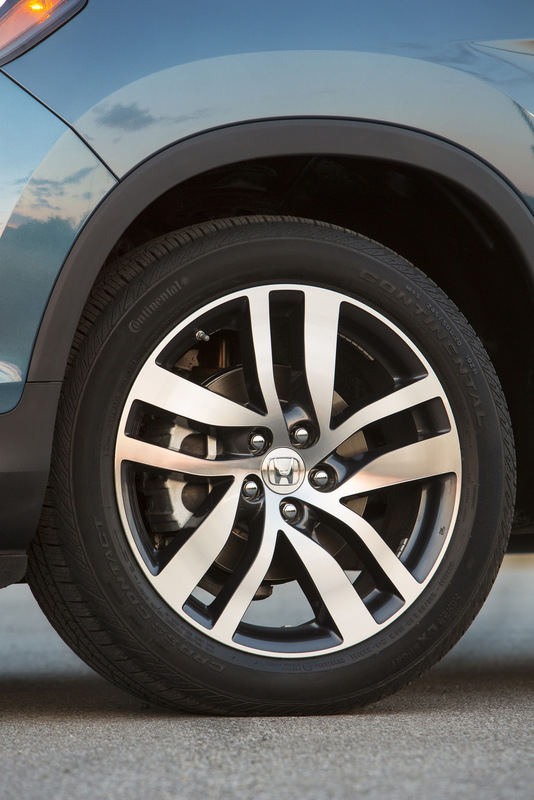 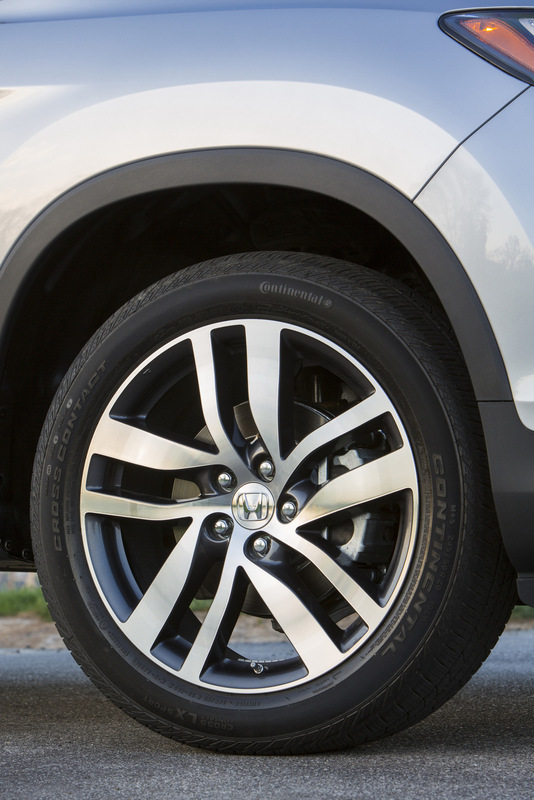 There’s also a new, range-topping Elite version that offers a series of Honda-first features including 20-inch wheels and tires, ventilated front seats, heated second-row seats, a heated steering wheel, a panoramic glass roof and other premium family SUV features. 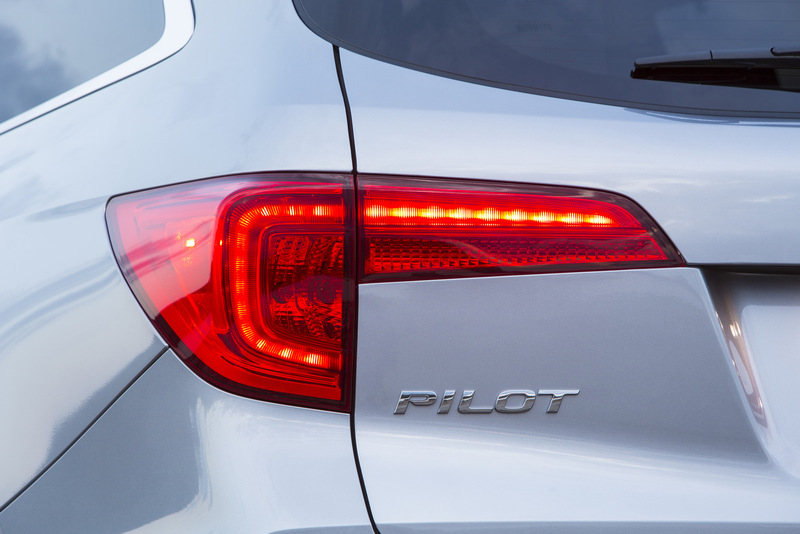 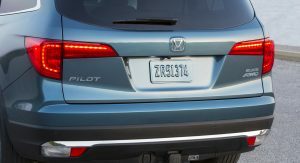 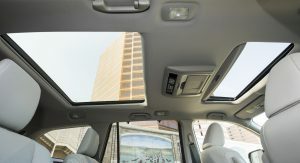 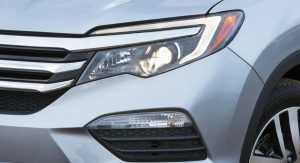 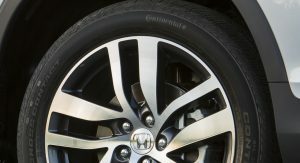 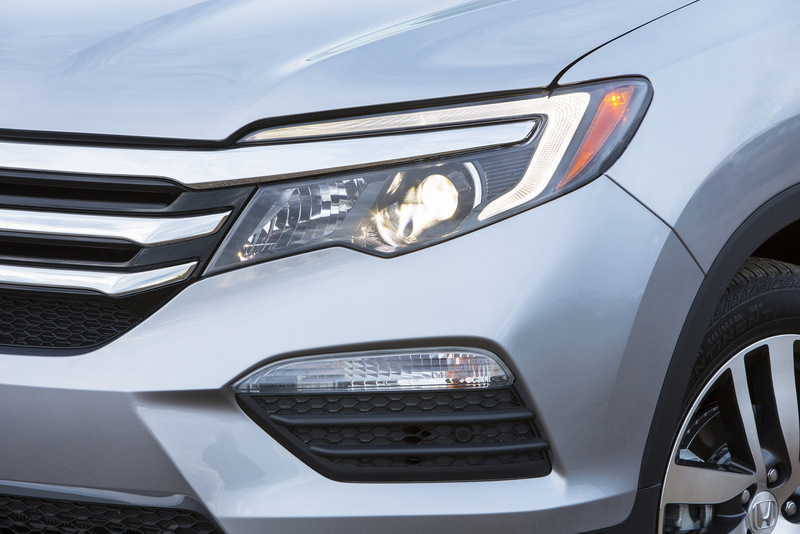 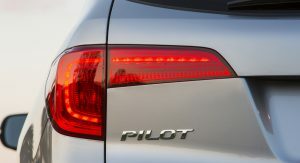 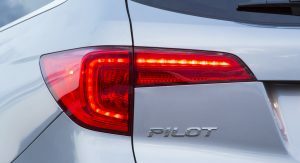 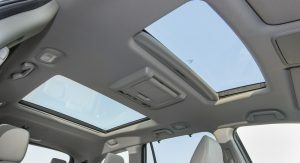 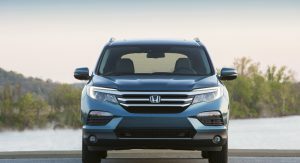 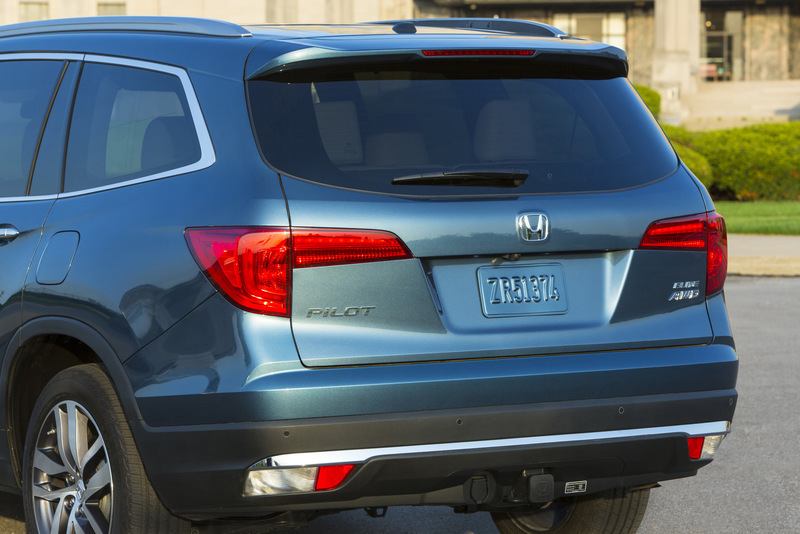 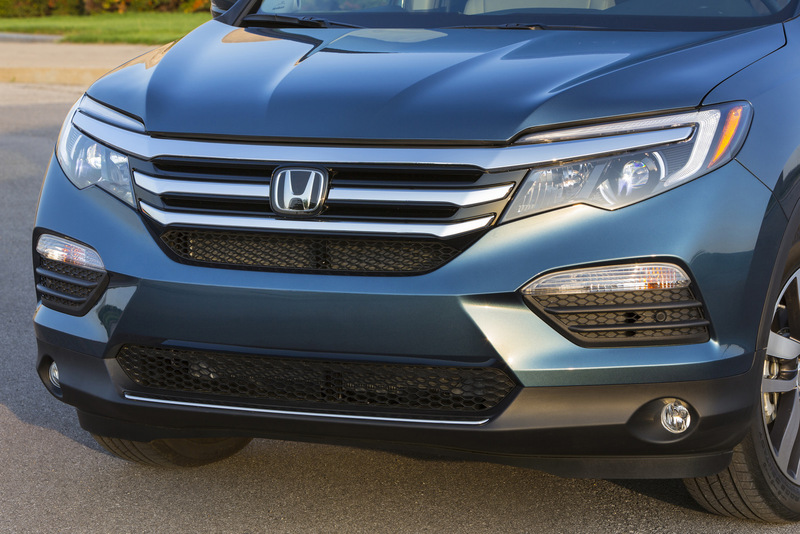 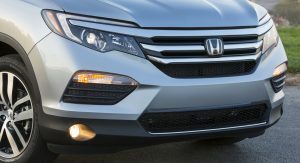 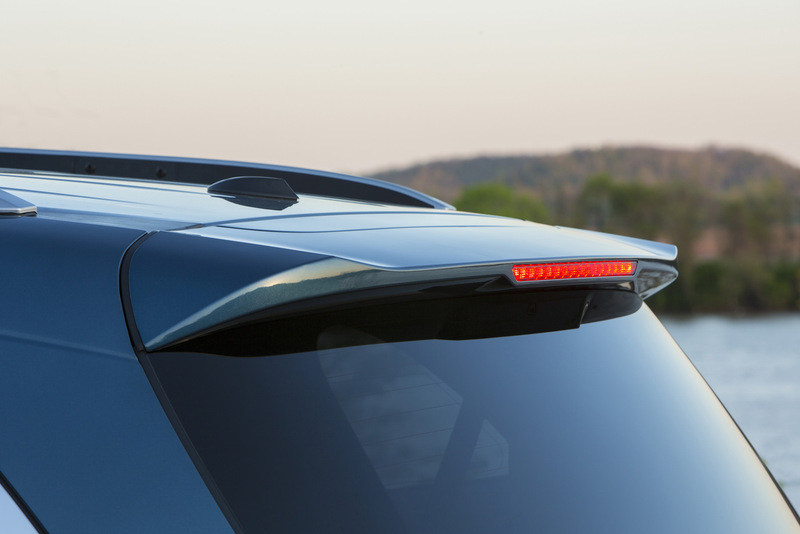 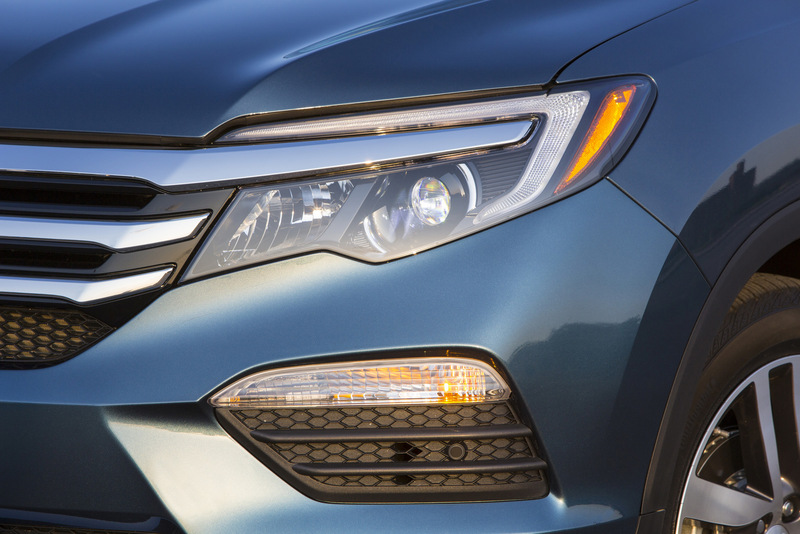 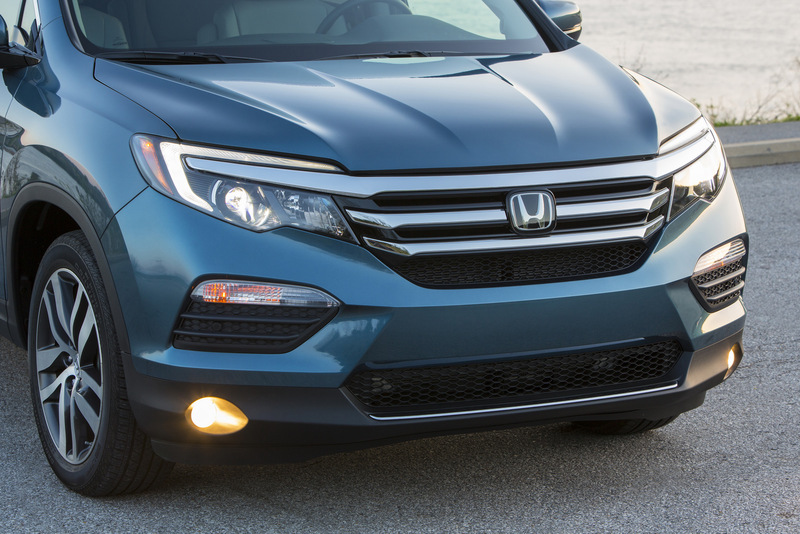 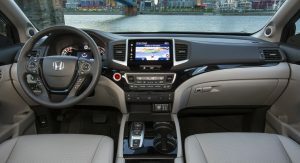 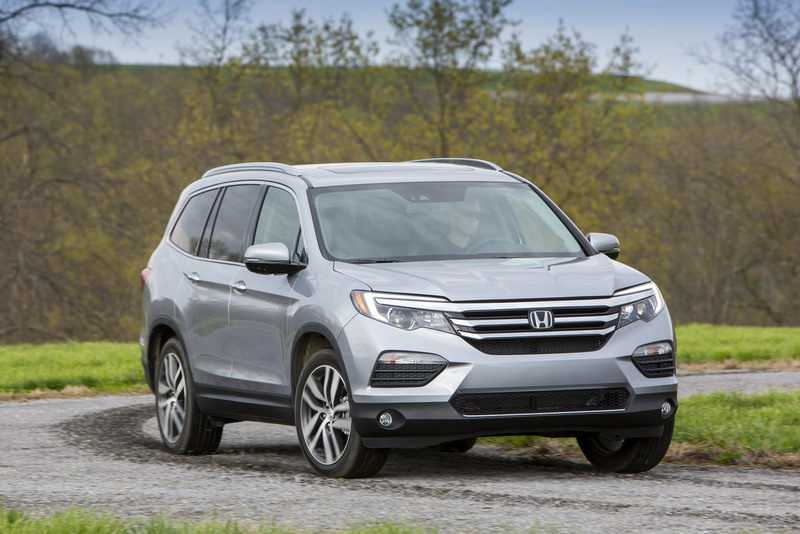 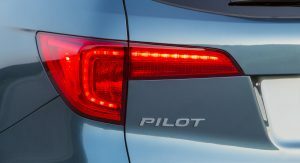 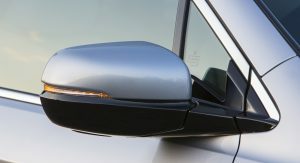 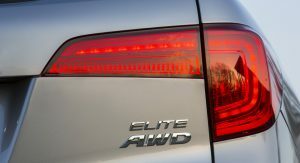 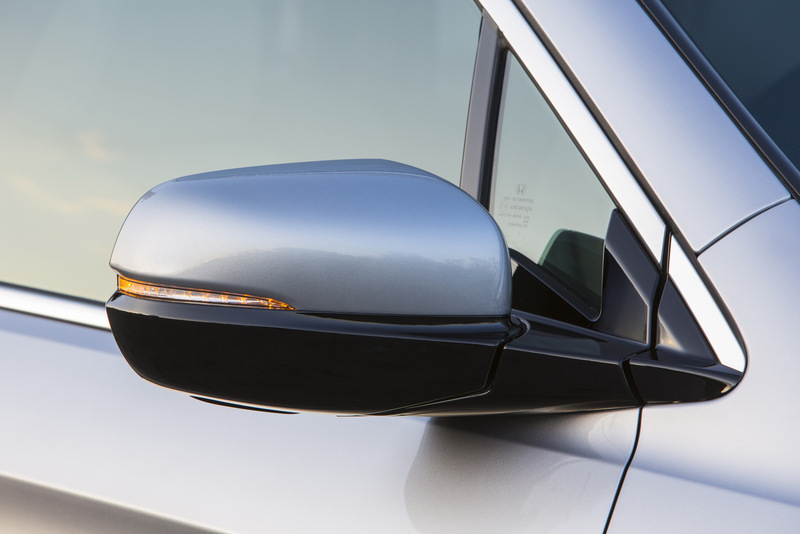 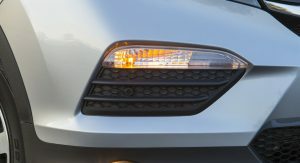 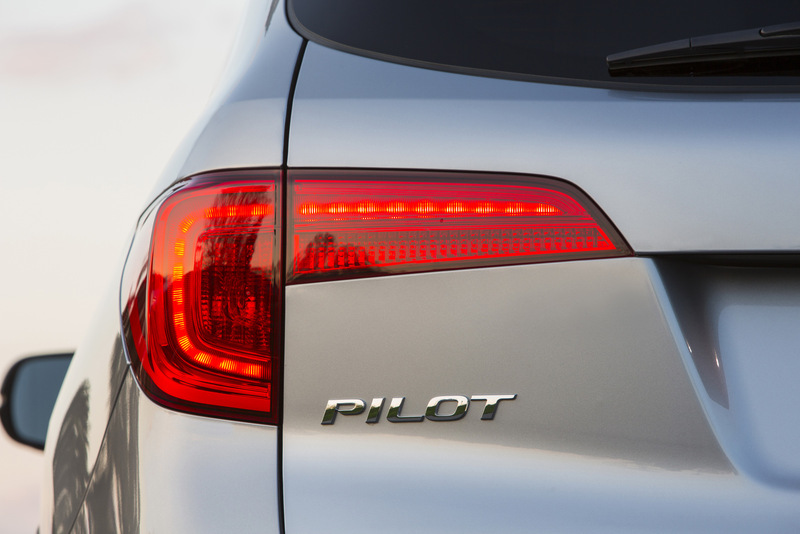 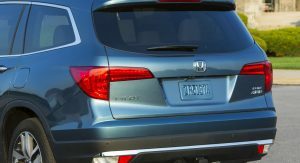 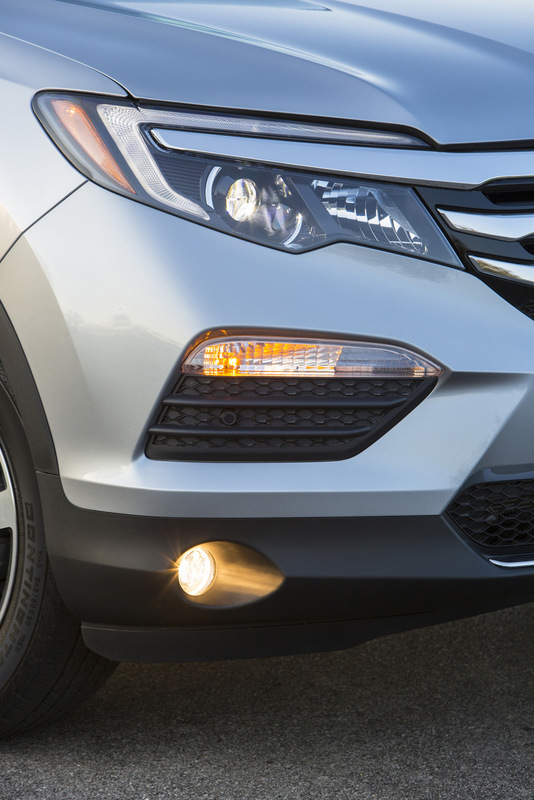 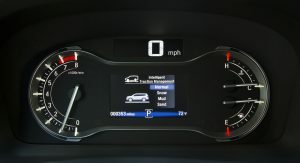 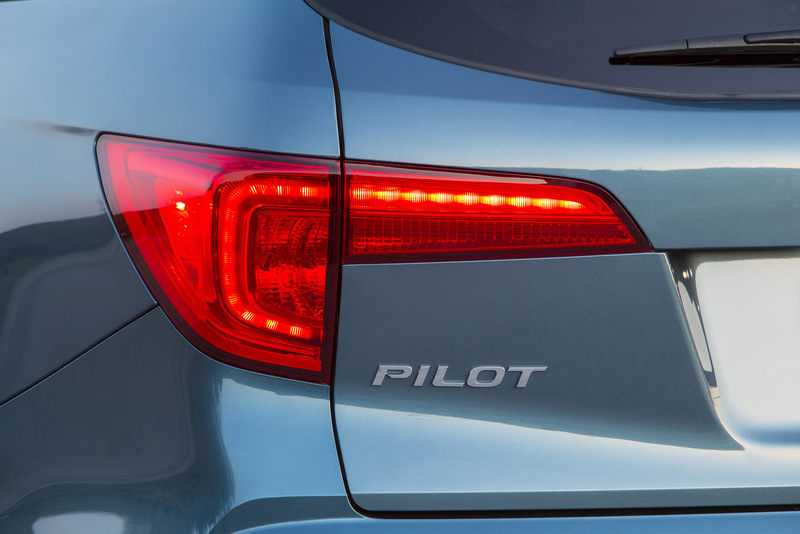 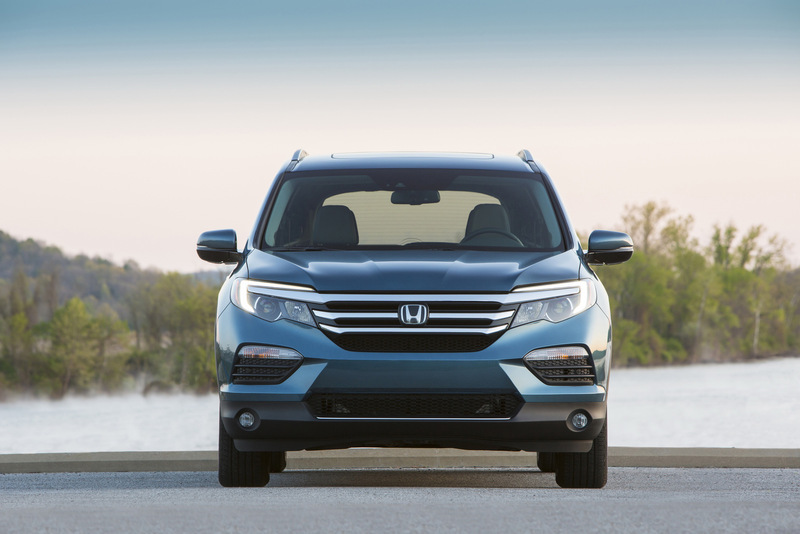 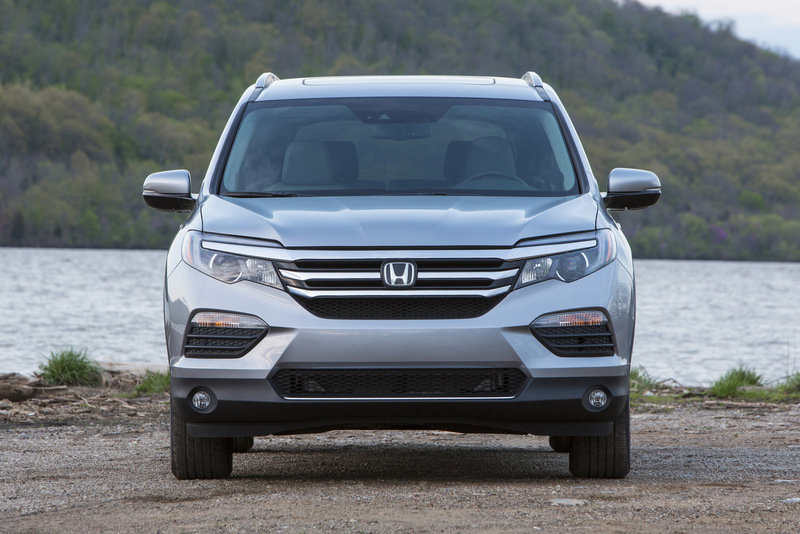 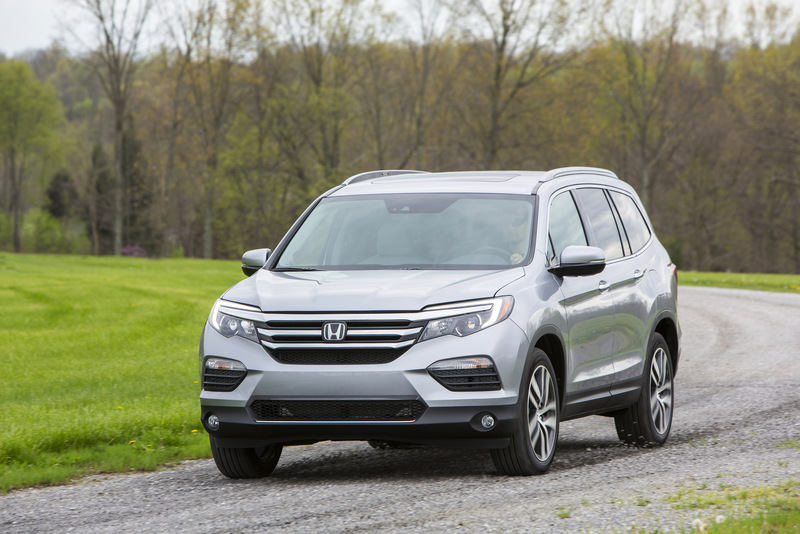 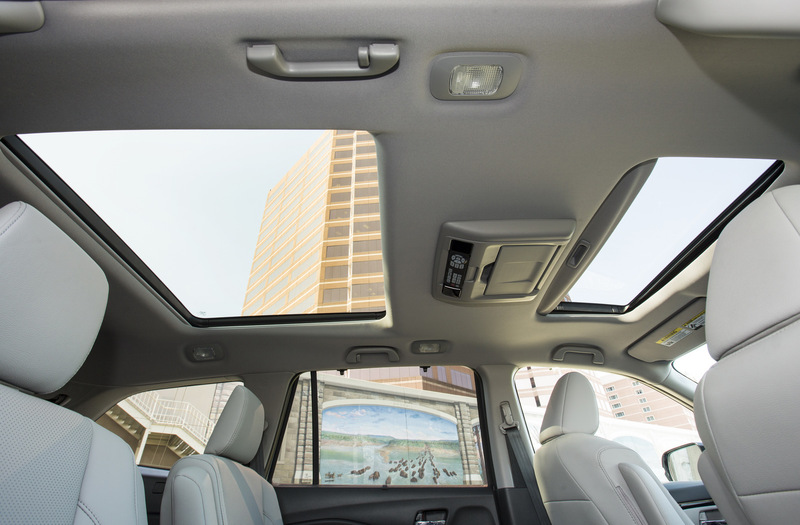 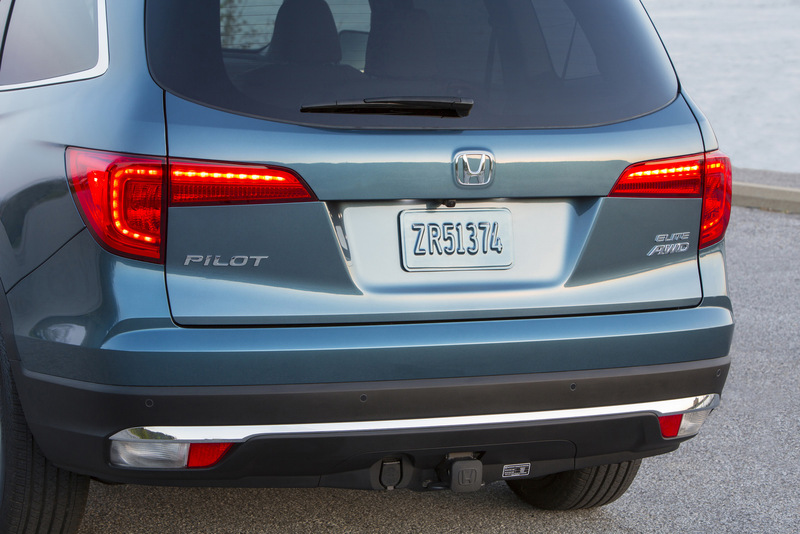 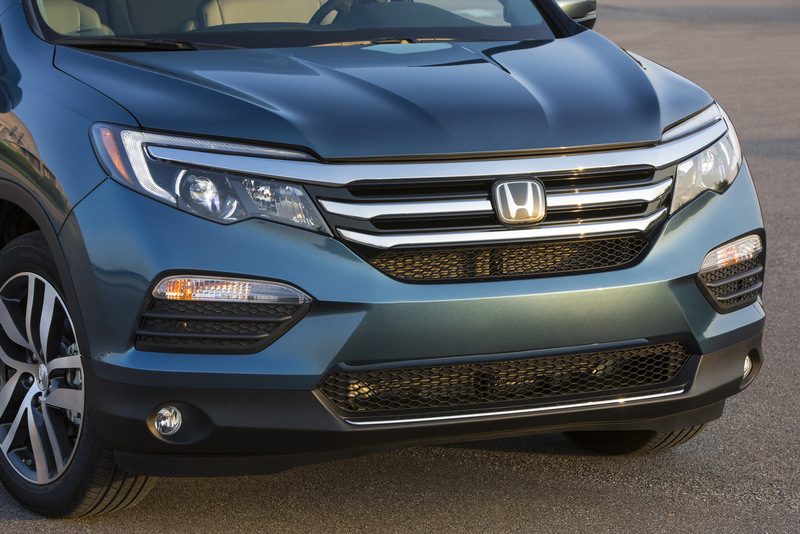 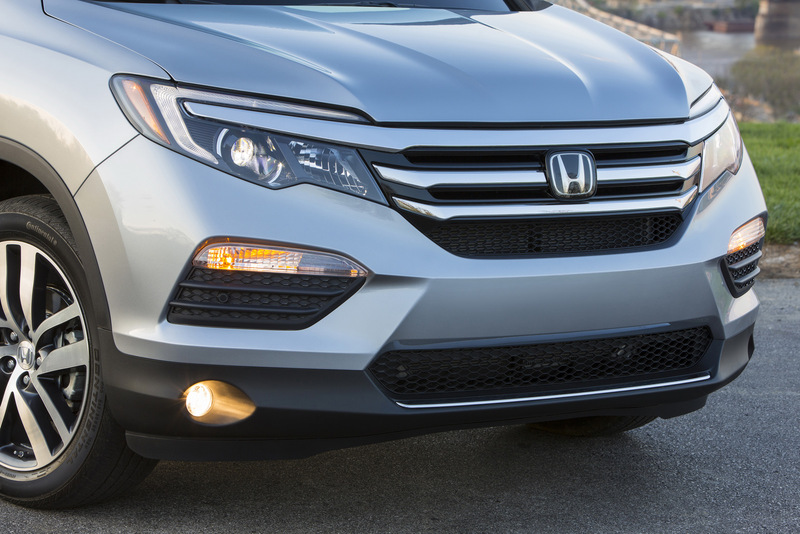 The Pilot also benefits from the automaker’s suite of Honda Sensing advanced safety and driver-assistive technologies. 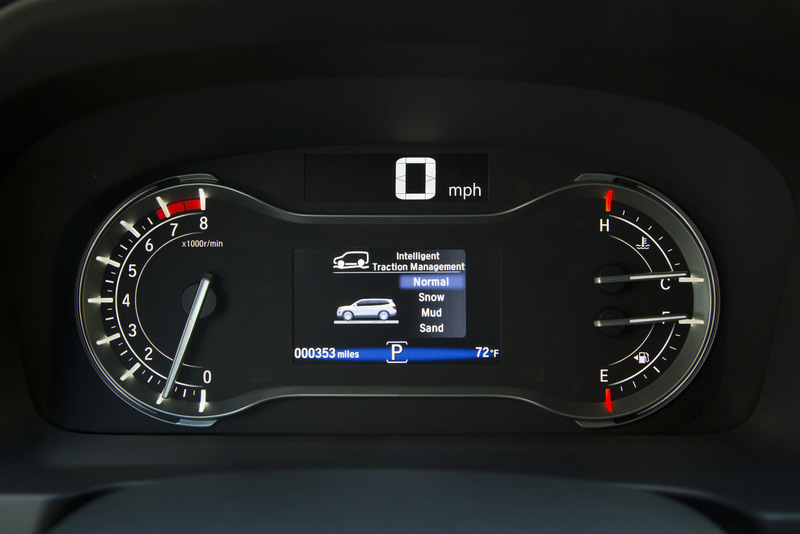 These include the LaneWatch display, Collision Mitigation Braking System, Lane Departure Warning, Forward Collision Warning, Lane Keeping Assist System, Adaptive Cruise Control, as well as two Honda-first technologies – Road Departure Mitigation (RDM) system and Rear Cross Traffic Monitor.